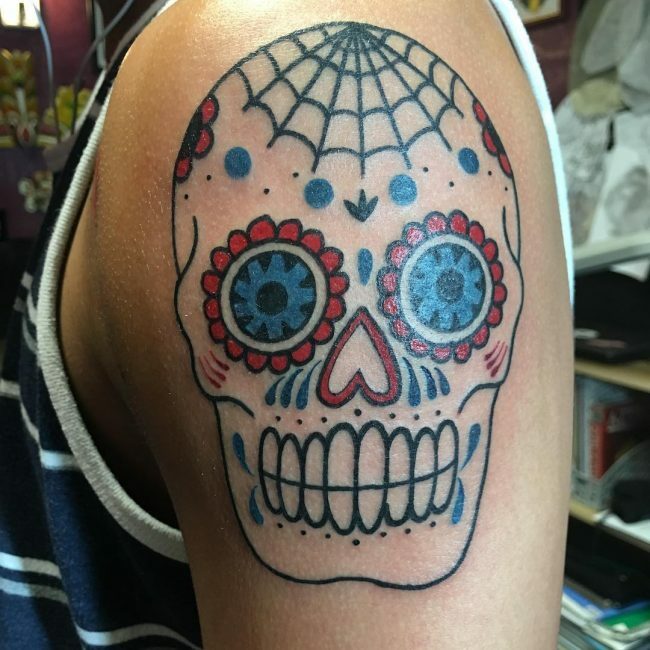 The sugar skull tattoo may not be as common as tribal designs, but they do hold equal amounts of significance. 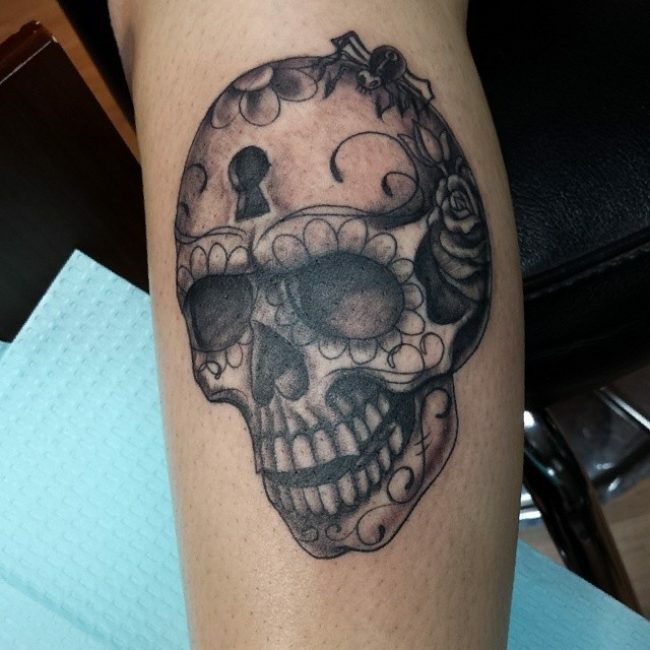 When thinking of a skull, the first thought that comes to the minds of many are death and decay; however, that’s not true because different designs can portray different meanings. 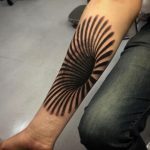 If you get to know the reasons people get these tattoos done on their body, the answers may shock and amaze you at the same time. 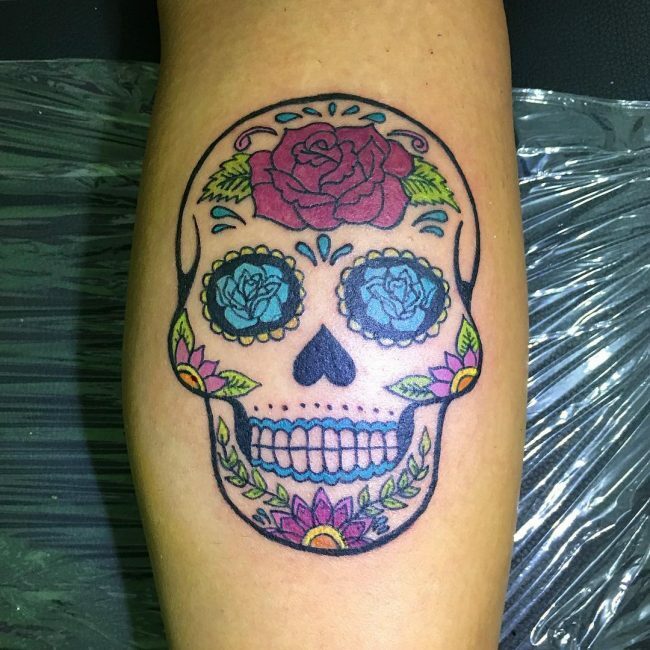 In the Mexican culture, for example, the statues symbolize “Day of the Dead” or in Spanish Dia de Los Muertos in remembrance to the ancestors that live in the people’s memory. 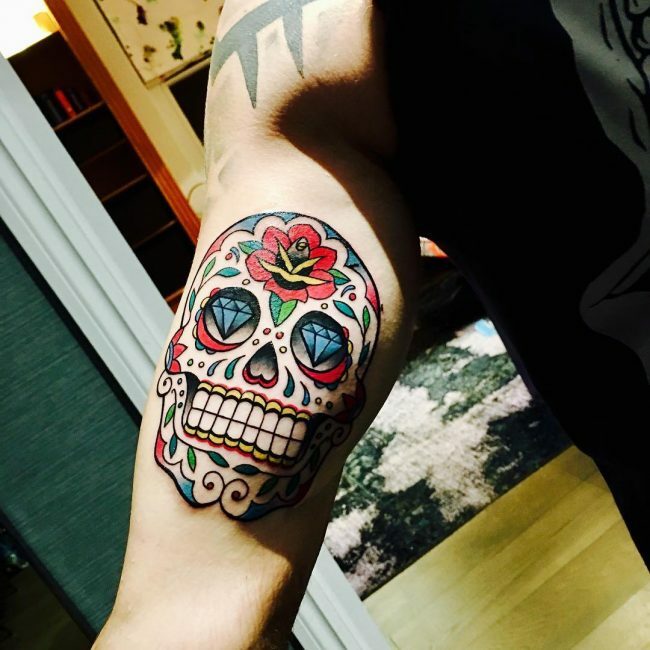 Usually, Mexicans use clay molded sugar skulls for painting and decoration with the names of the departed added to its forehead. 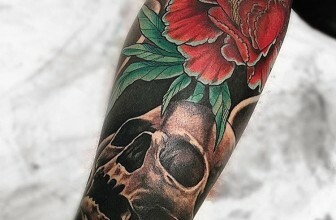 Then this call is placed on the gravestone to encourage the departed soul to rise and meet their loved ones on the special occasion. 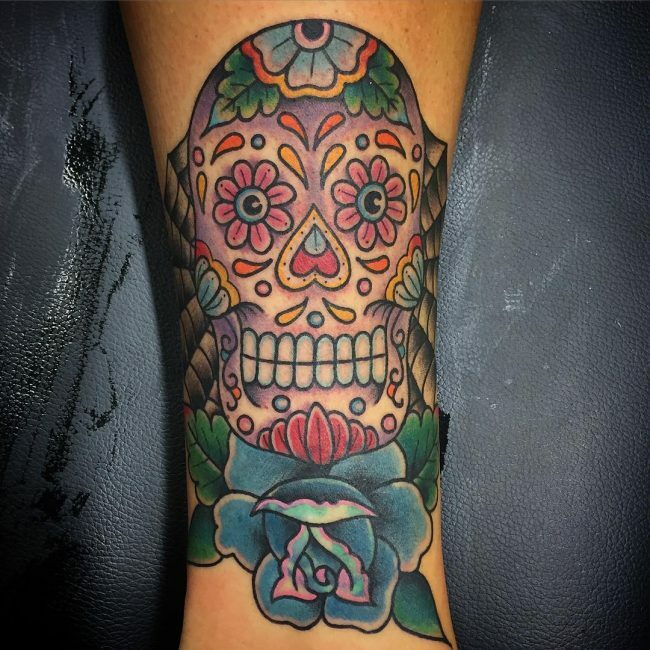 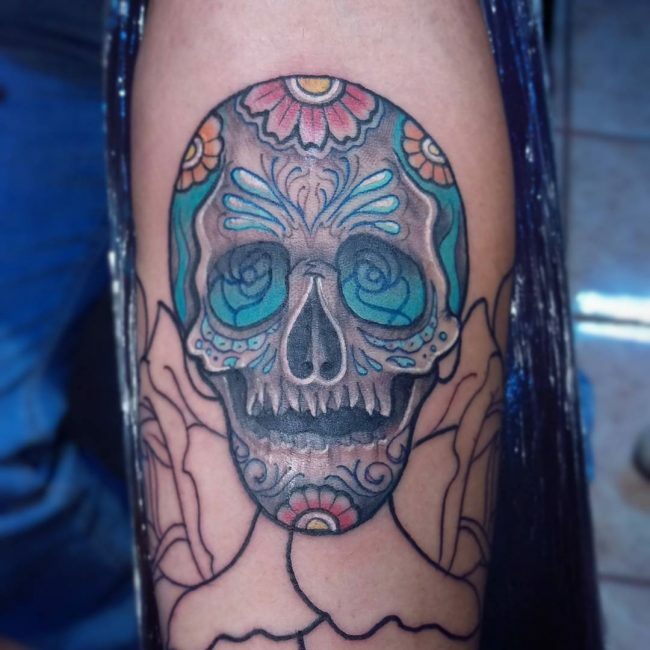 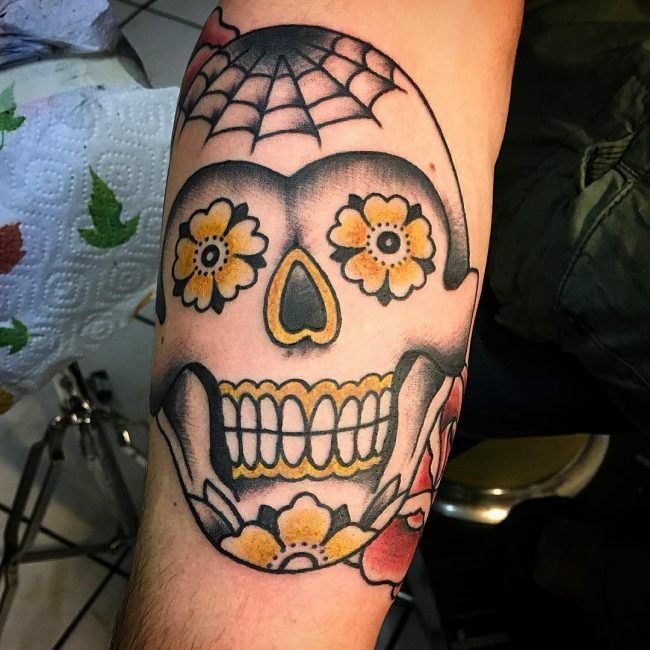 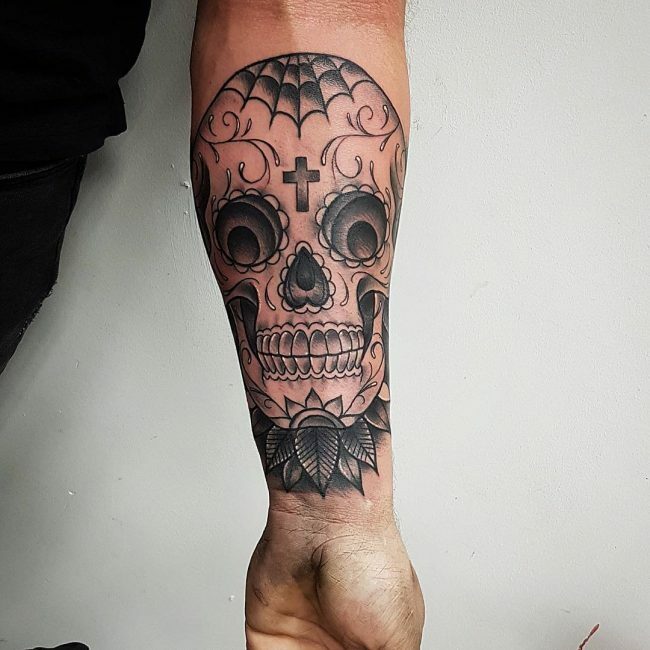 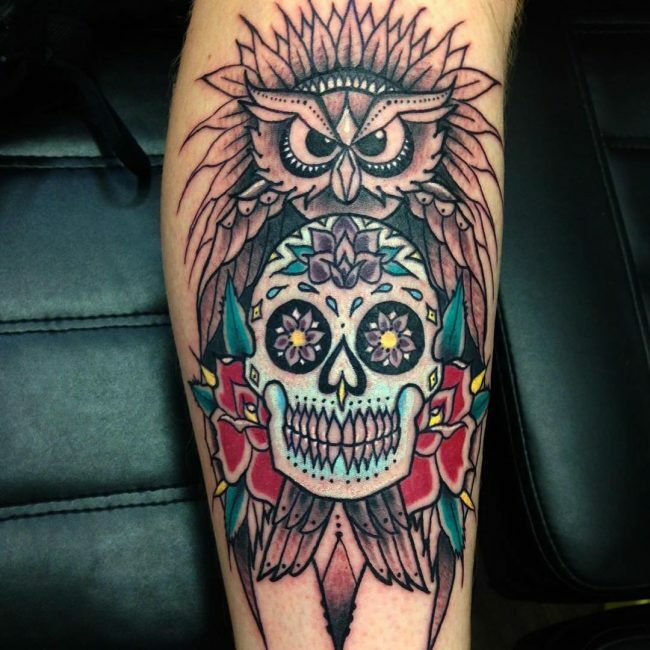 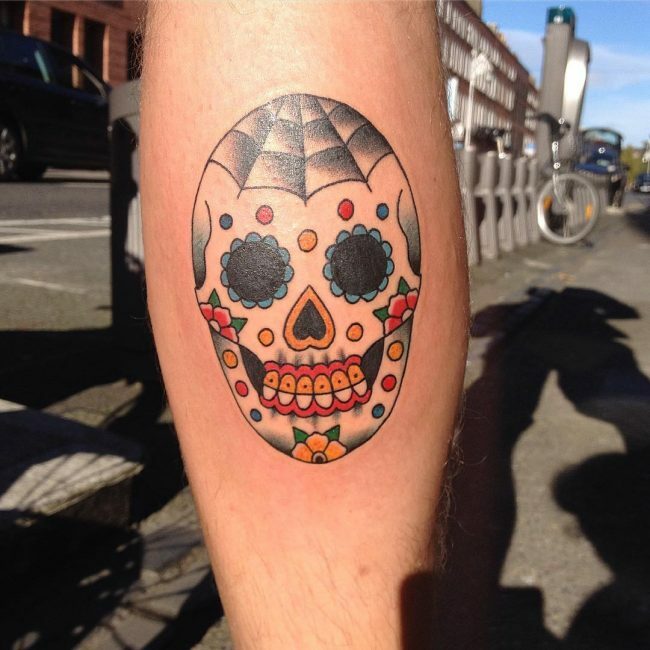 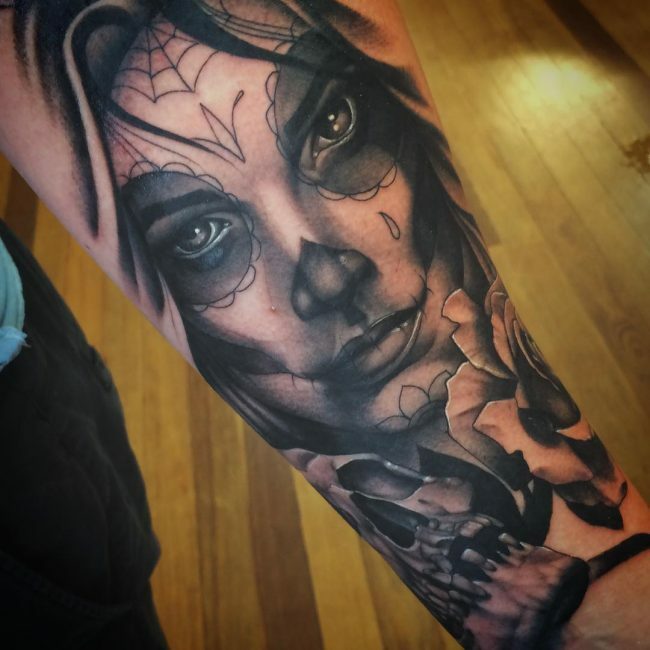 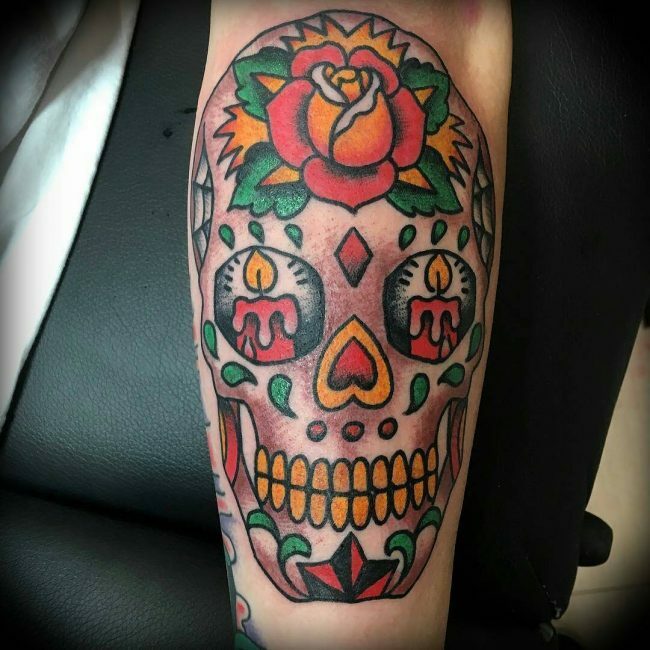 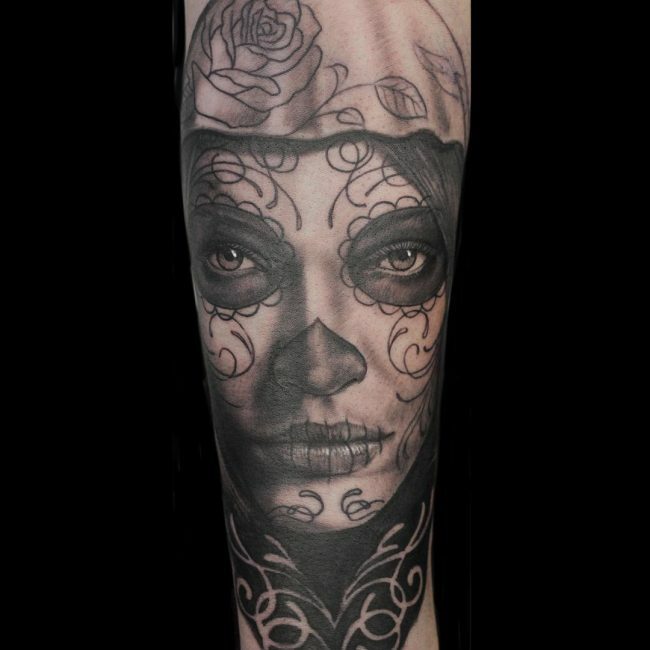 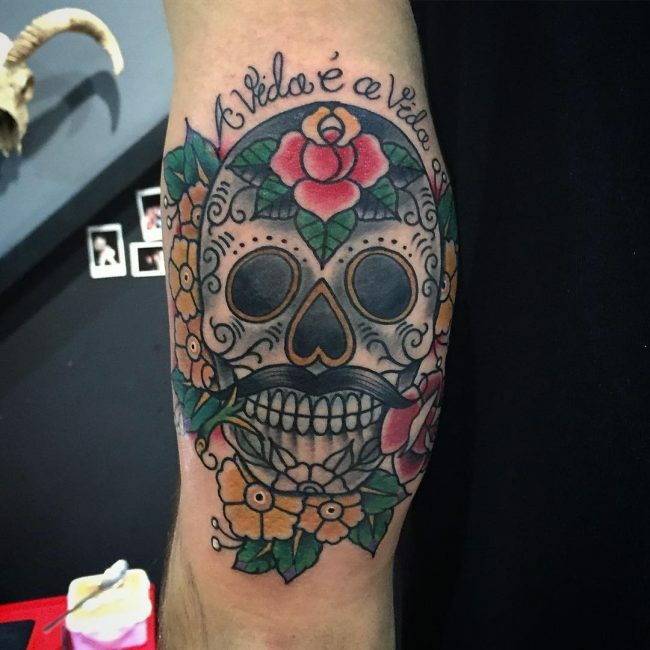 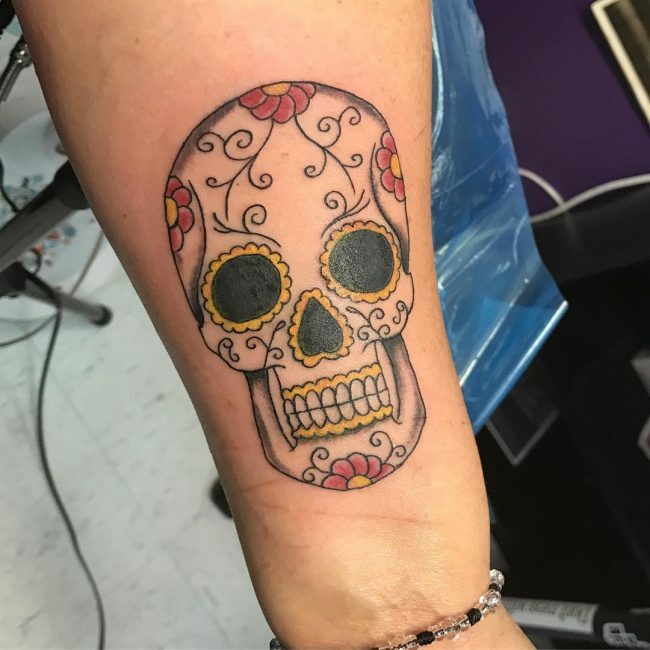 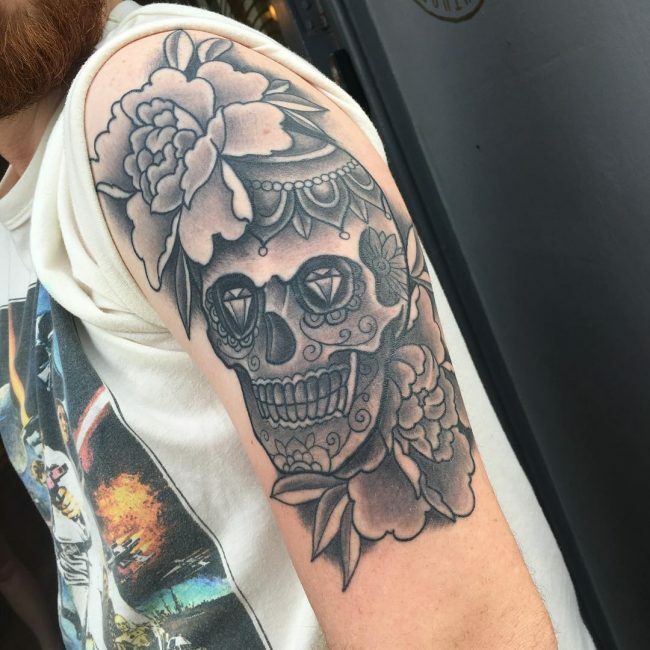 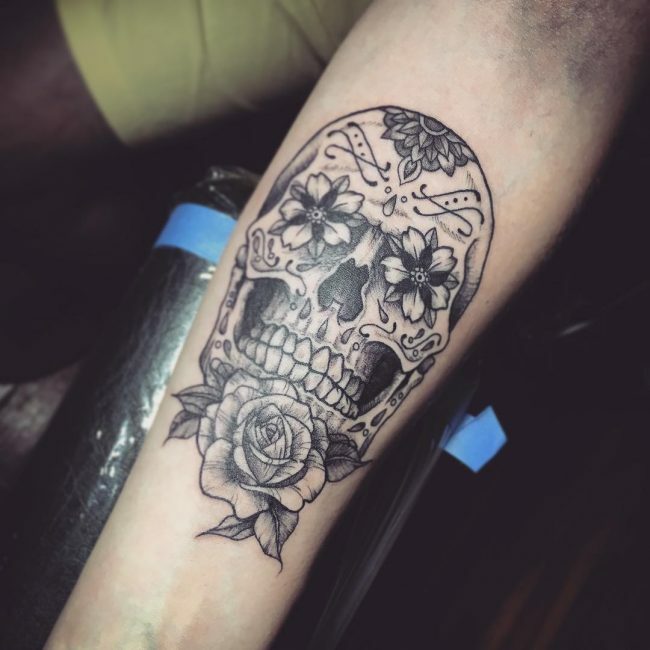 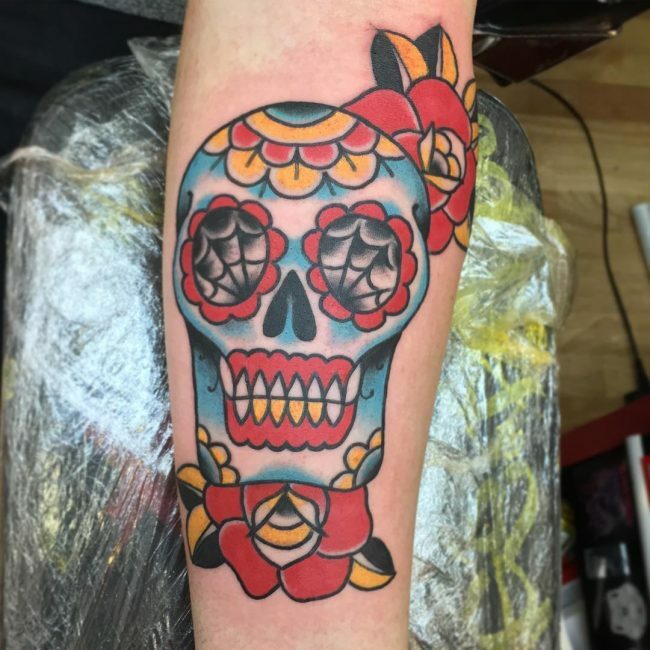 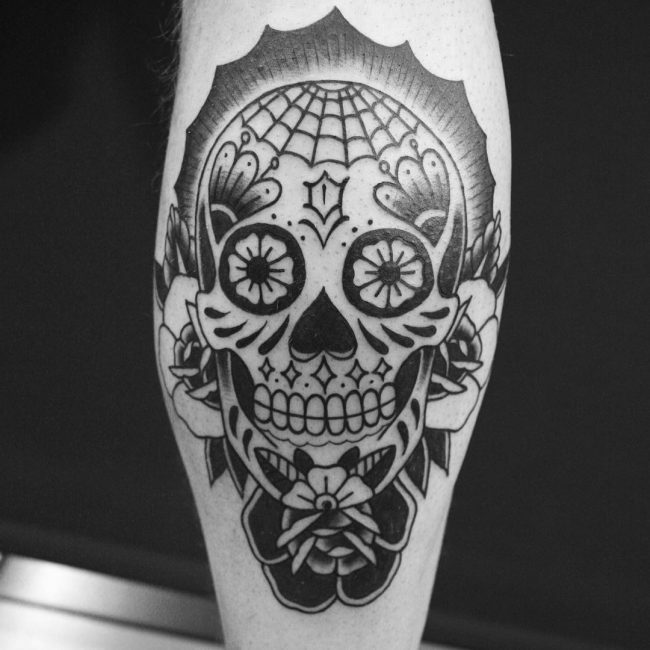 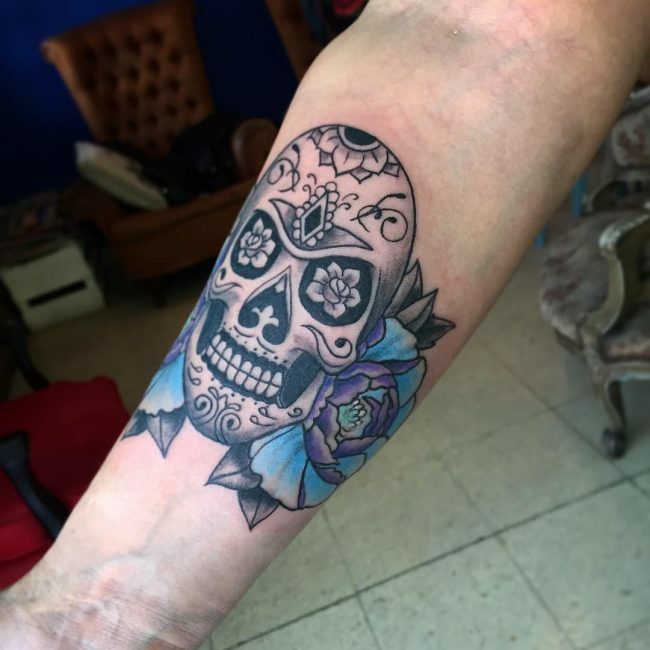 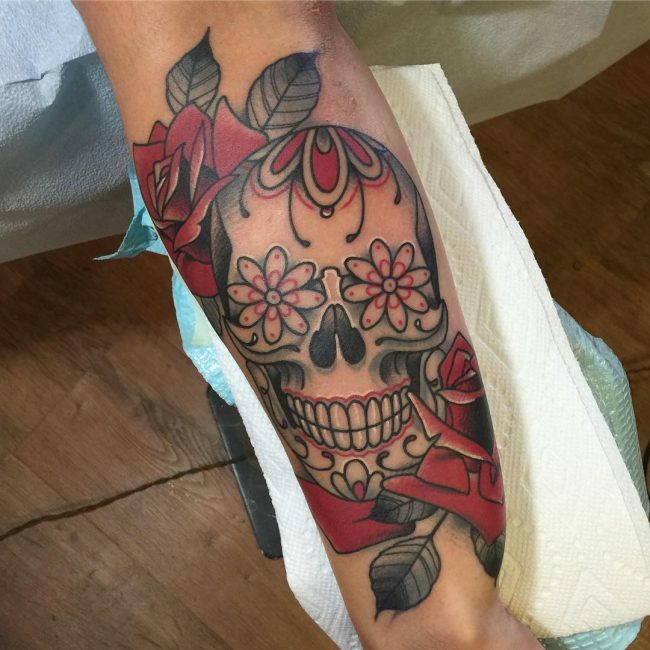 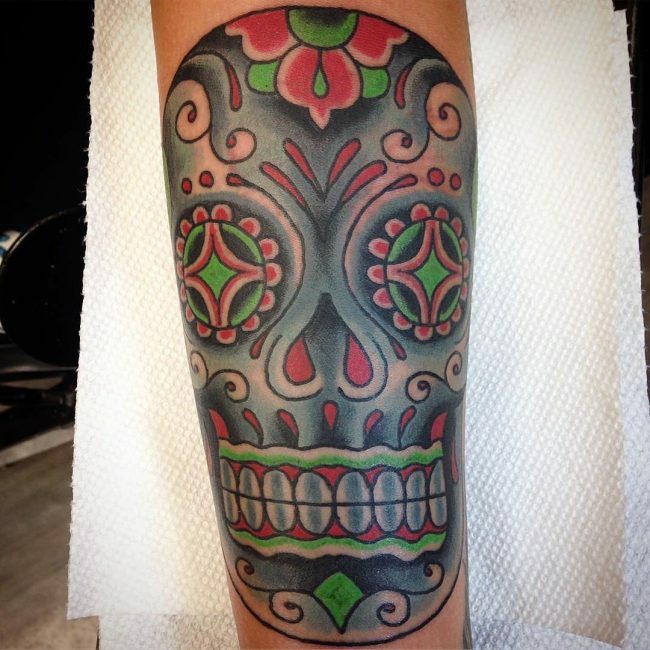 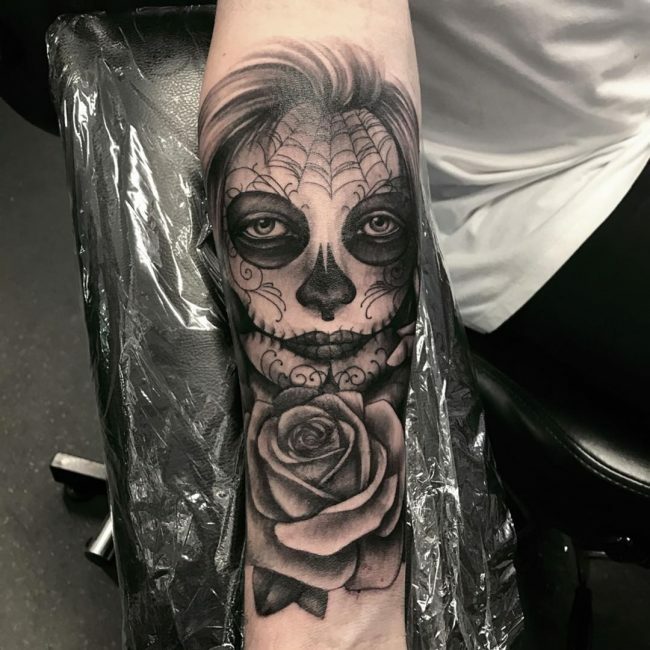 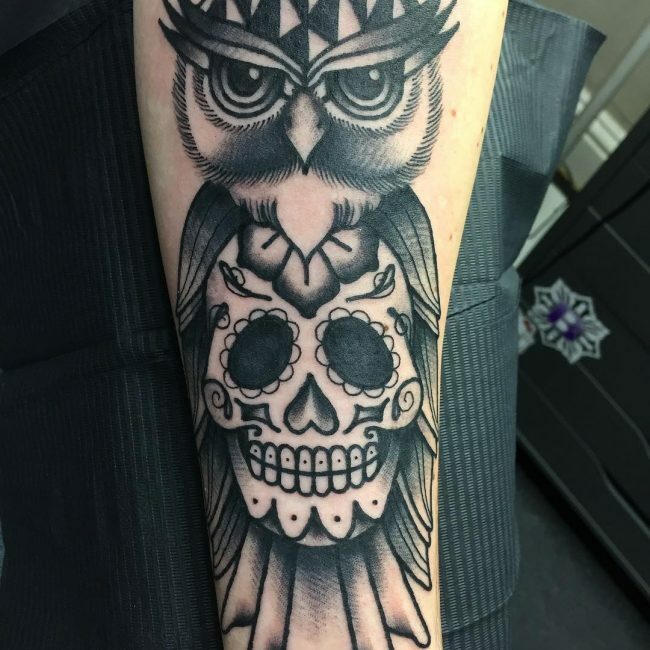 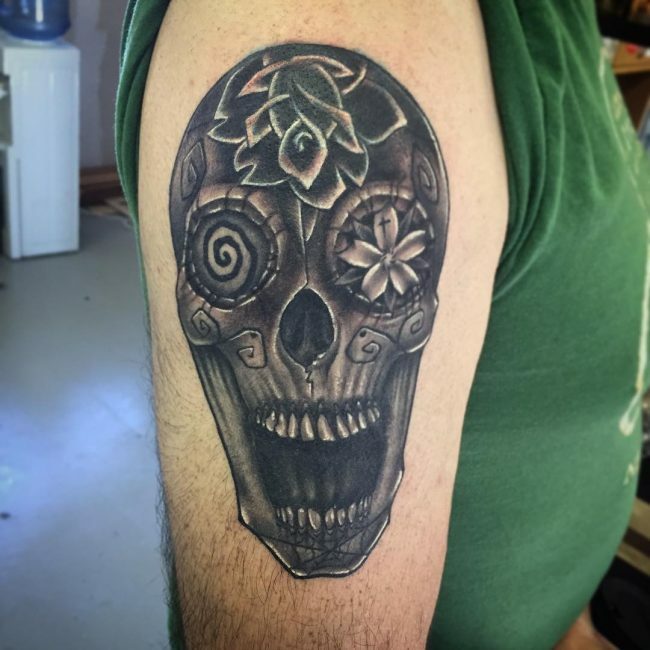 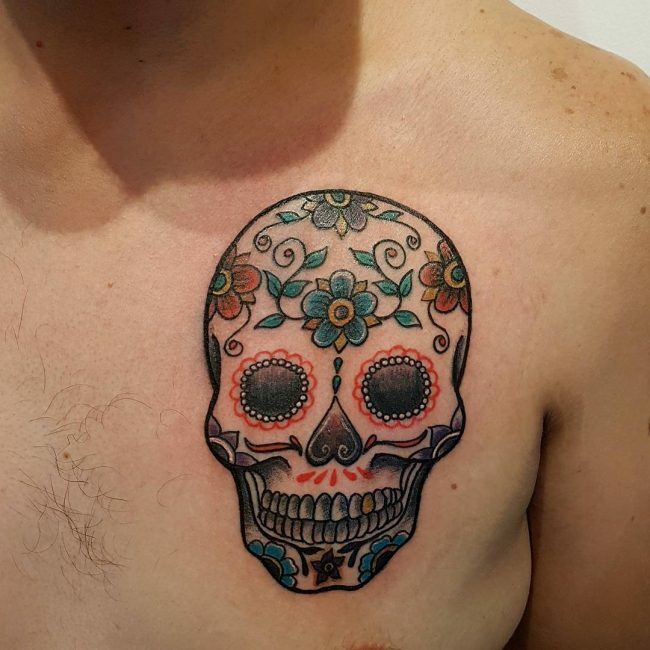 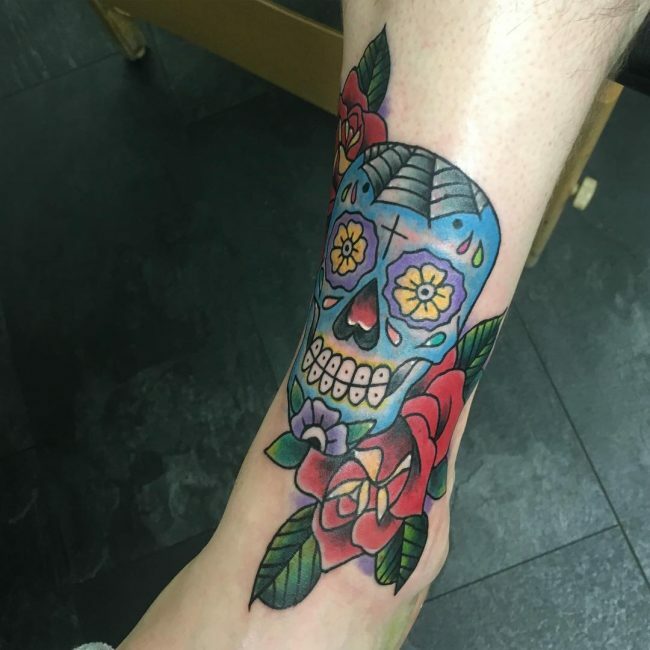 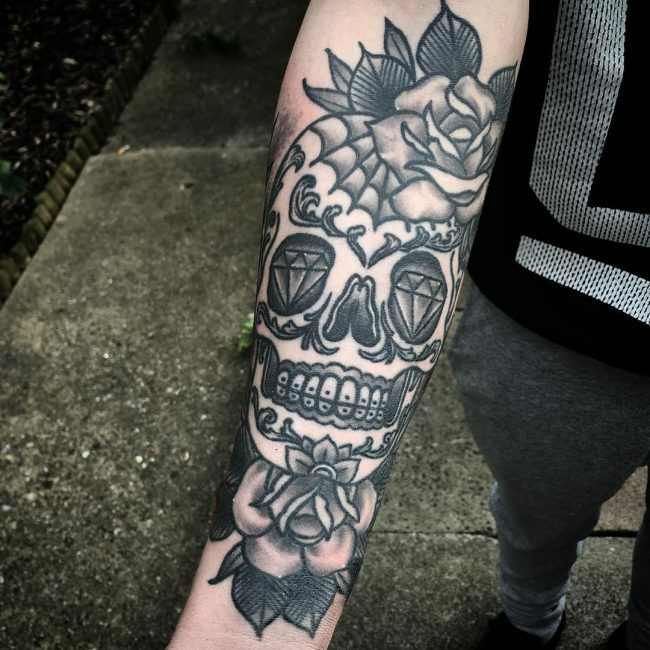 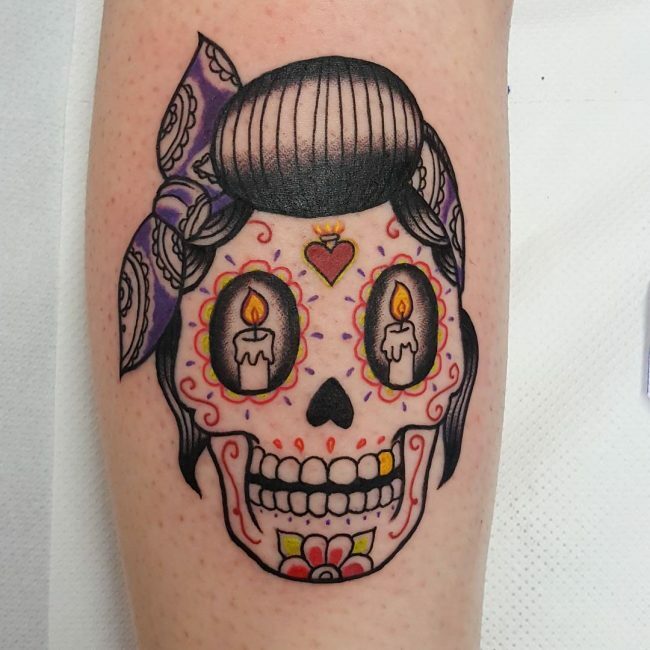 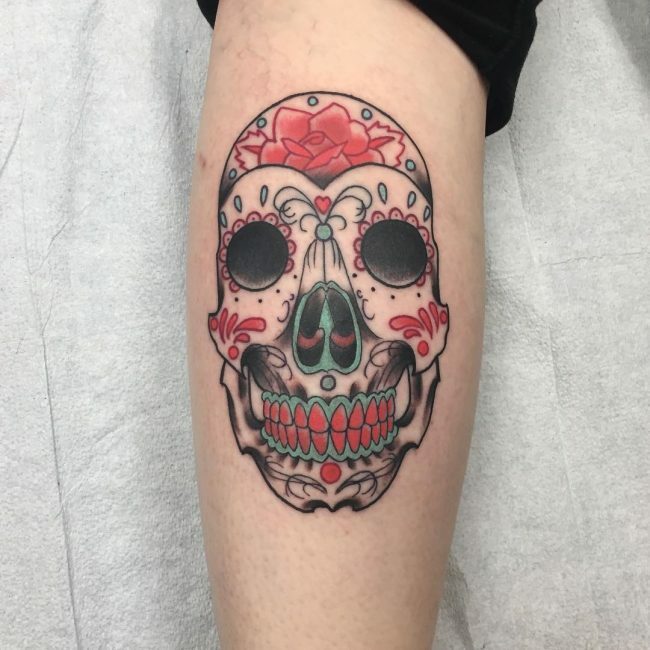 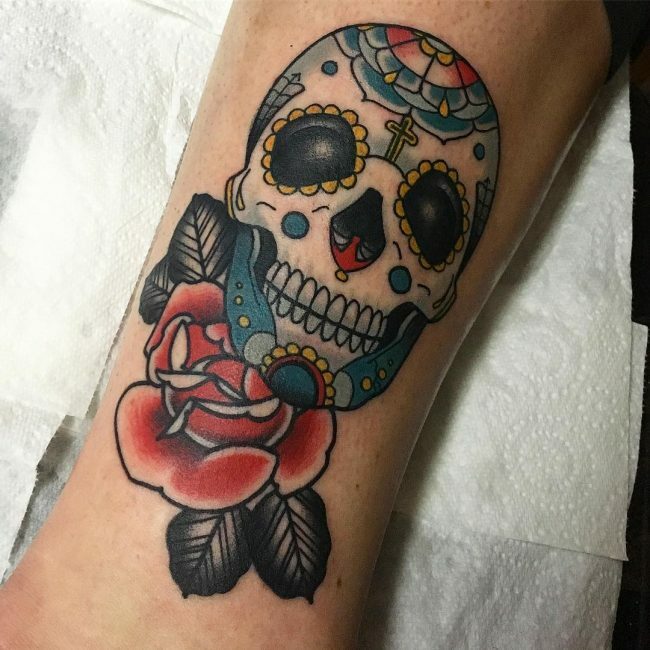 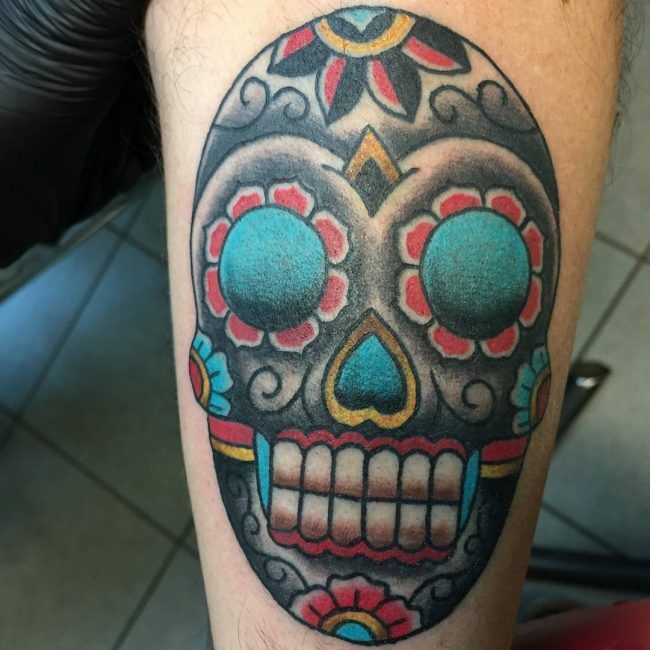 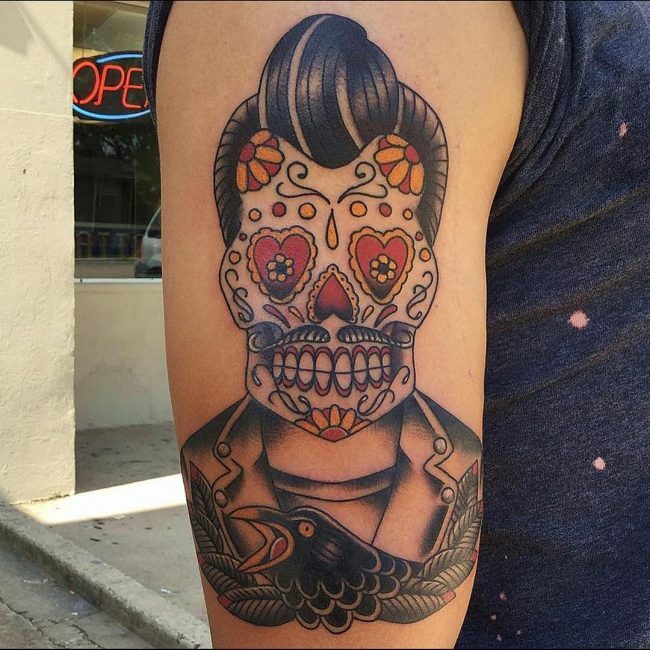 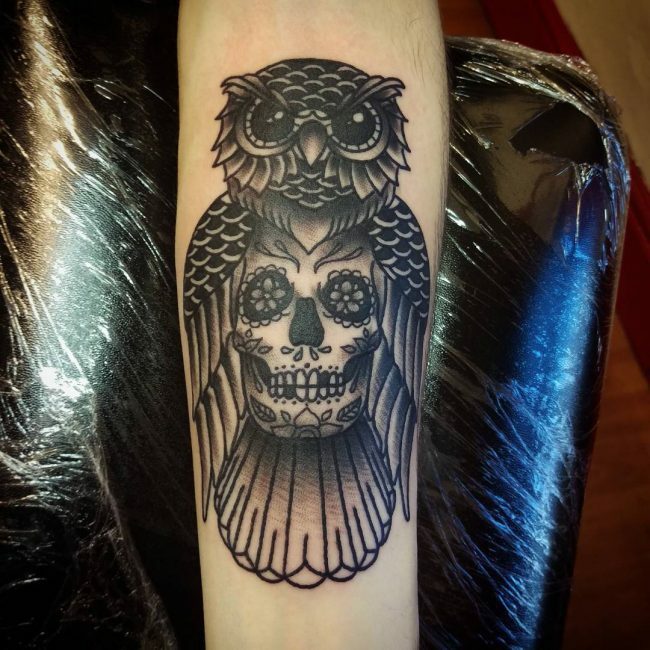 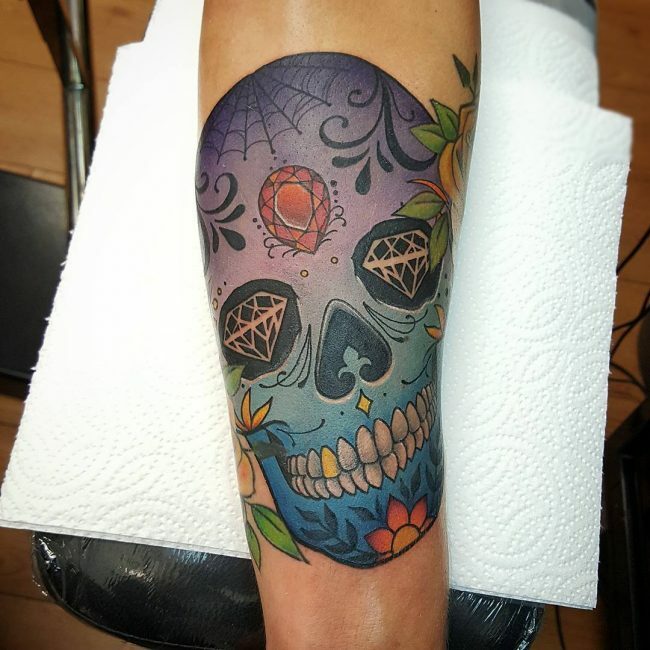 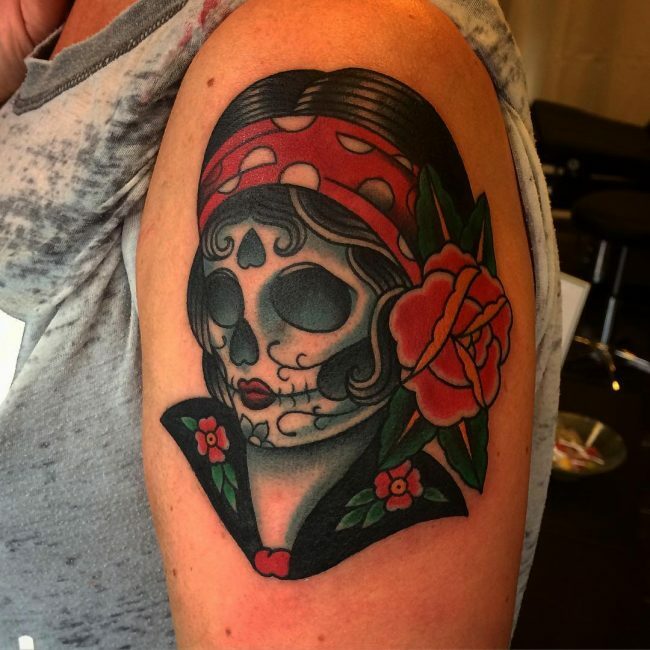 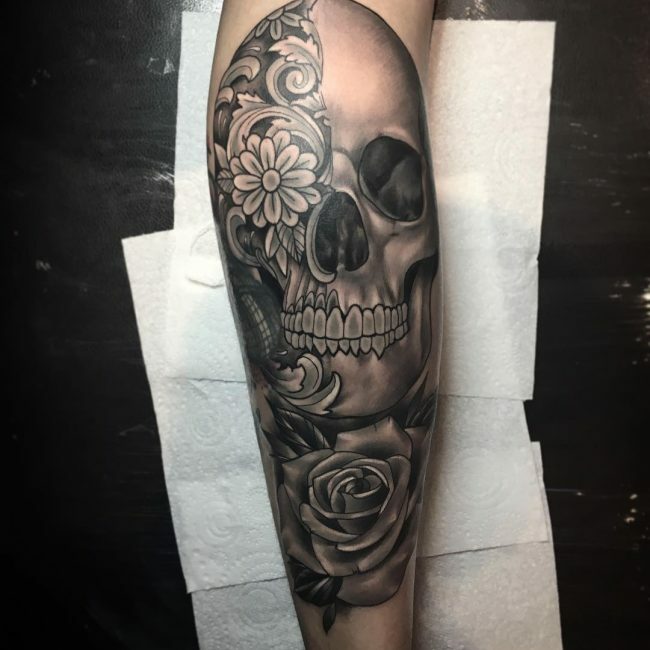 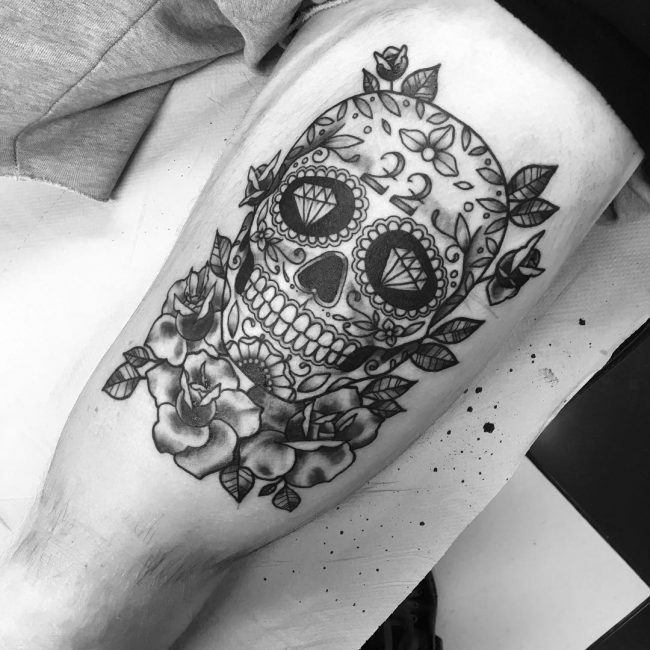 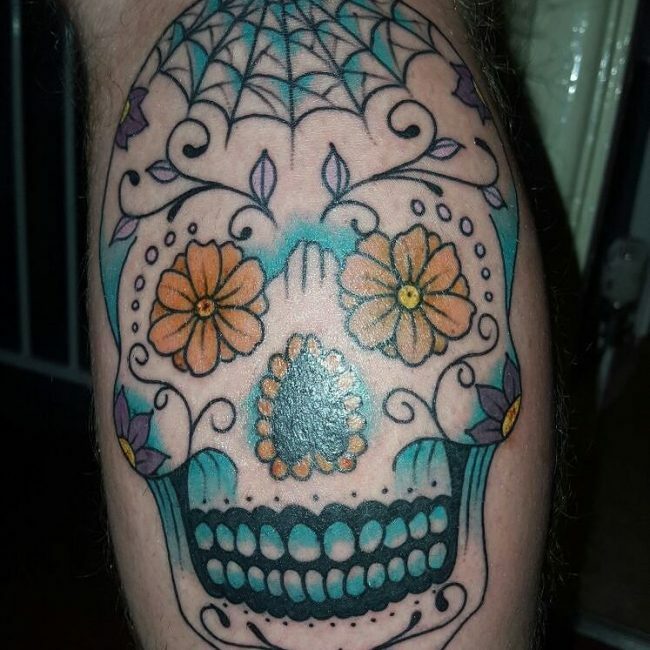 Just like in Mexico, skulls represent different things in different cultures and tattoos are just another medium to portray the significance on one’s body. 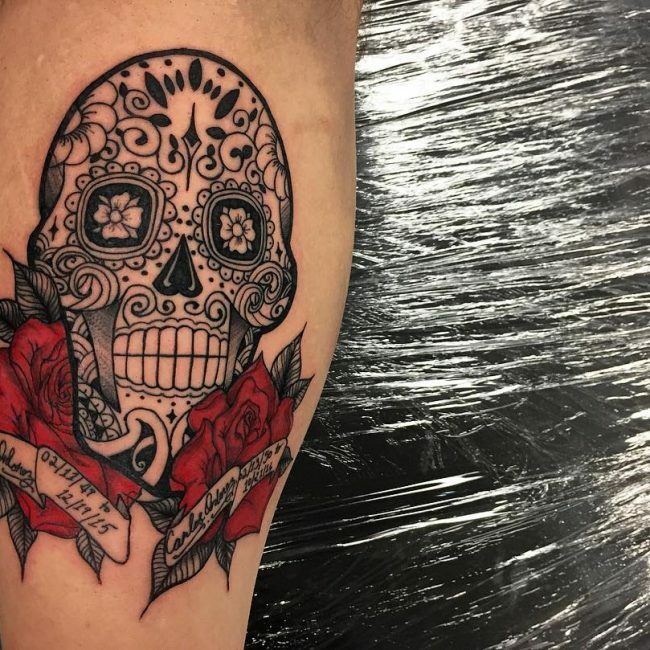 Even though Hollywood often portrays people sporting these tattoos to be associated with gangs or criminal activities, the reality is far from different. 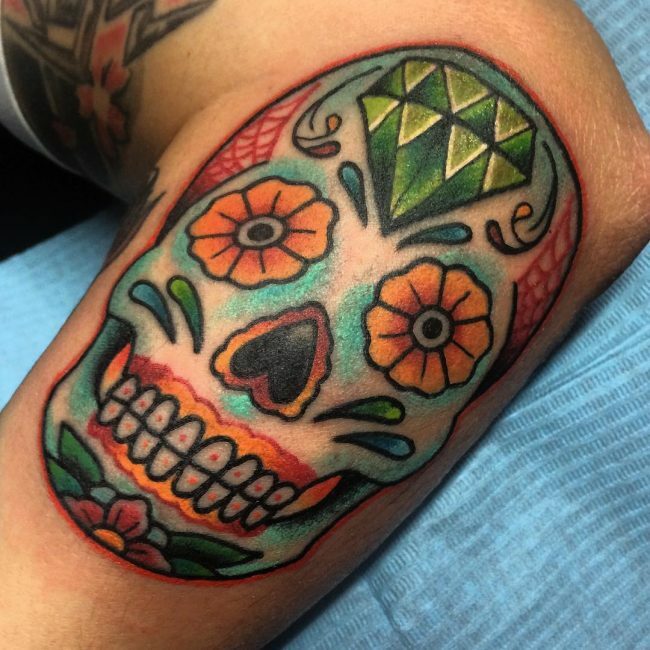 In ancient civilizations, skull tattoos often represented major change and celebration of life. 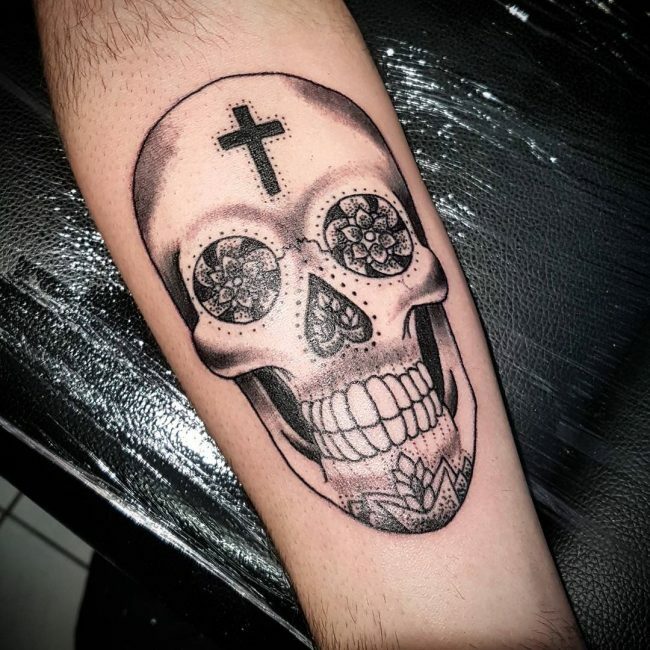 Religion also influenced the meaning of these tattoos, for example, the skull in Christianity often symbolizes the eternal remains of the soul after the human form has passed. 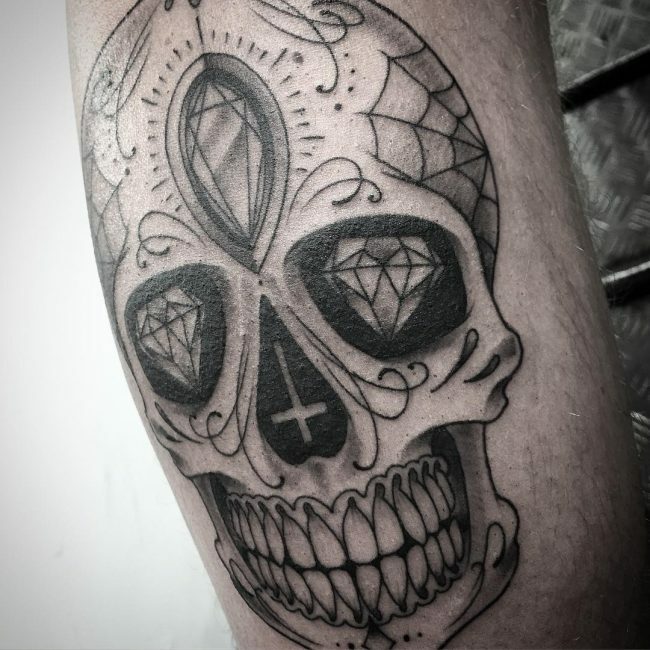 Skull tattoos are also portrayed as a sign of revolution among those who want to stand out from the crowd. 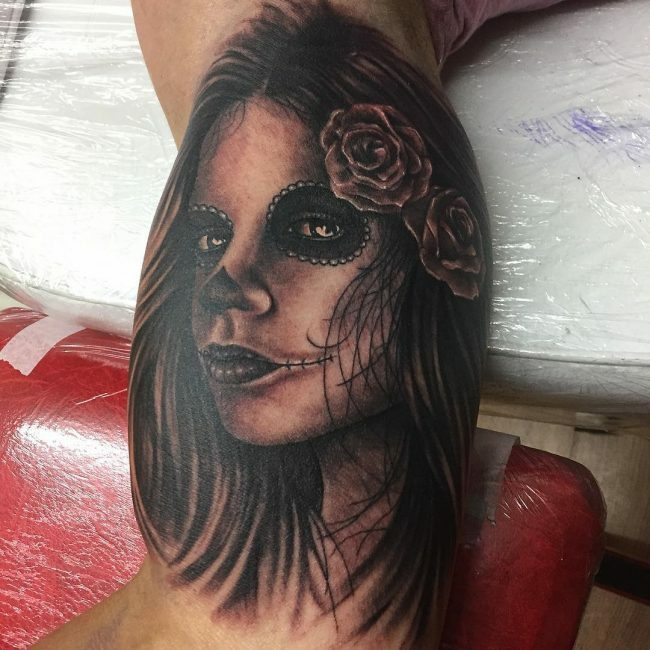 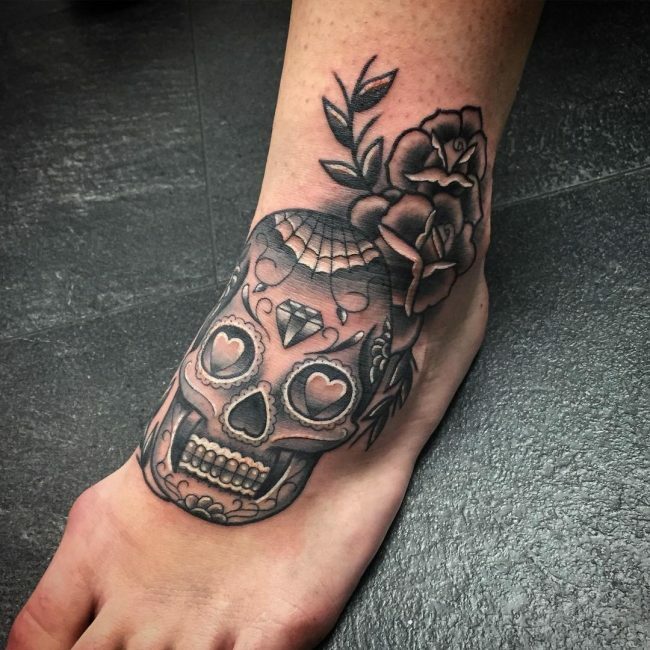 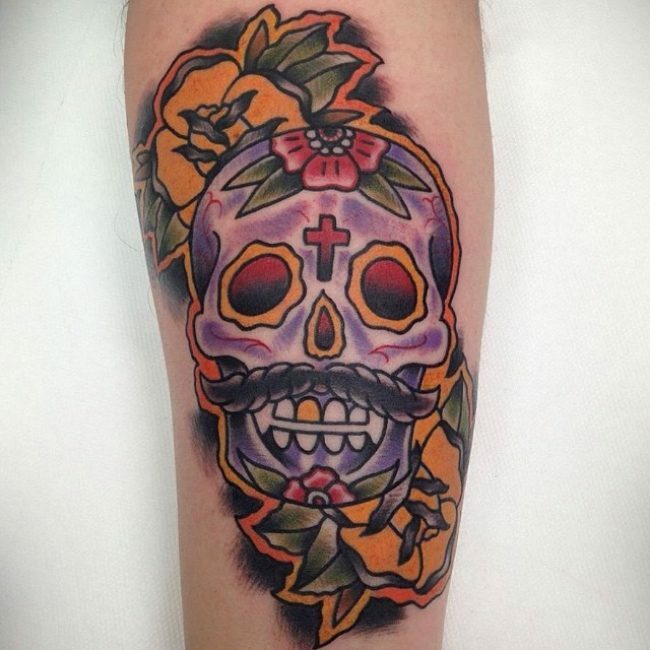 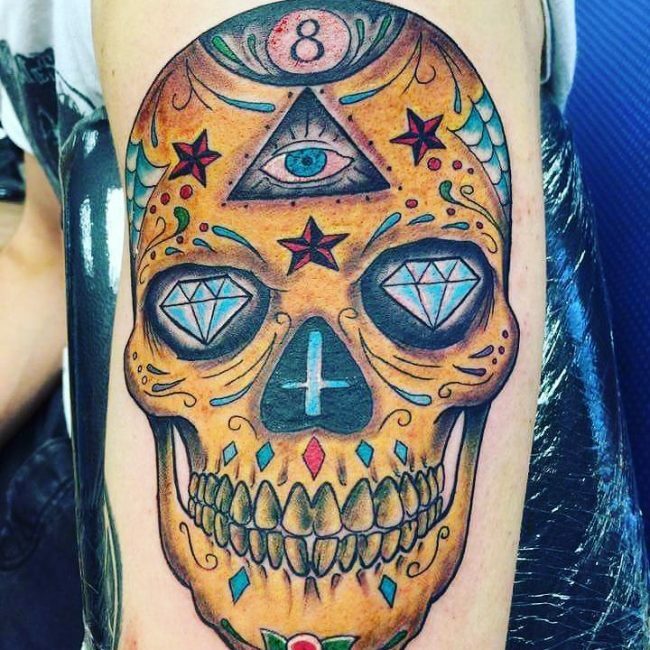 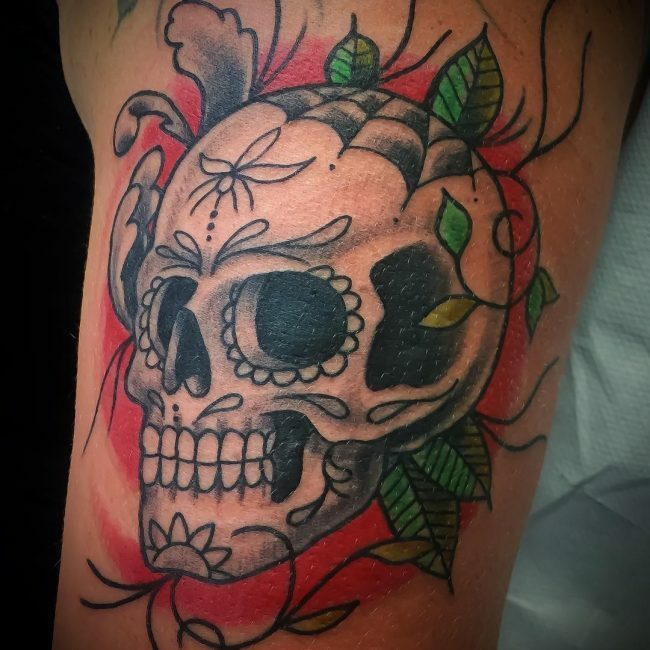 Skull tattoos are also many a times accompanied by other objects like flags, pirate ships, snakes, flowers, and even animals to signify a particular meaning. 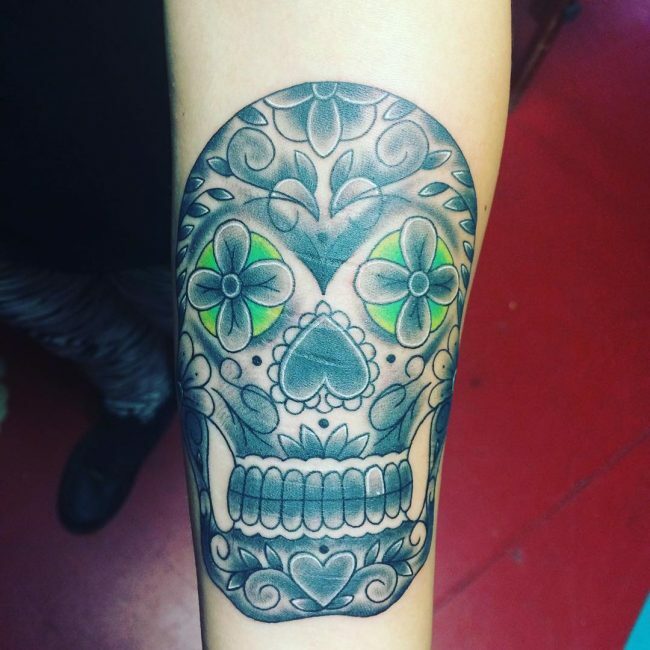 In many cultures, skulls also symbolize protection and strength to live life. 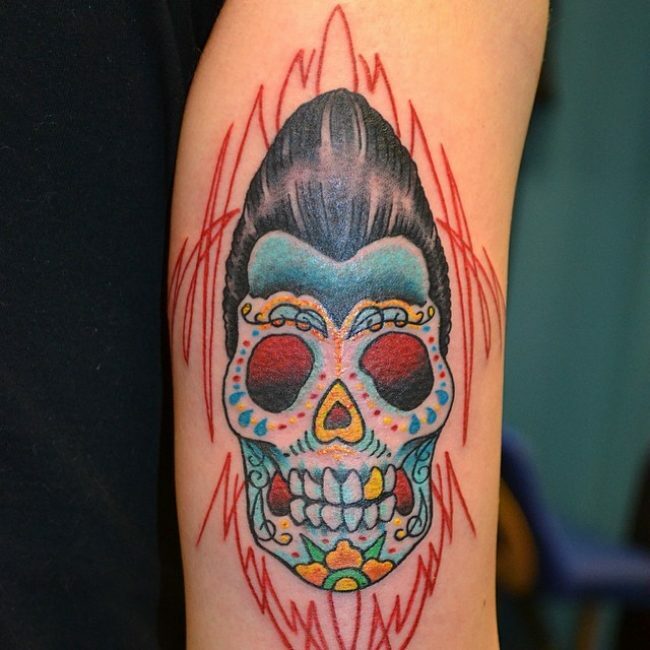 In the books of history, it is said that skulls were also used as a tool of intimidation by rulers and dictators. 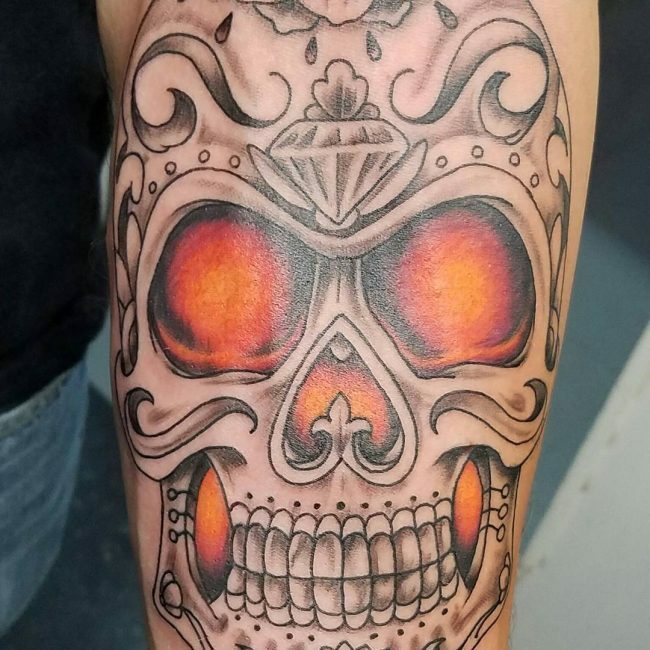 They would often collect the skulls of their enemies as a trophy in order to show dominance and instill fear in the hearts of those who dared to defy them. 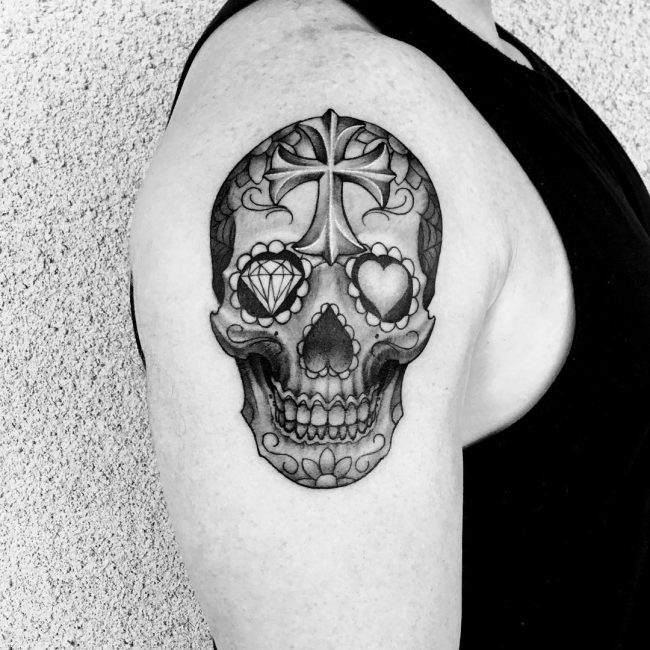 Skulls were also left purposely on conquered villages and towns as a warning to those arrived later. 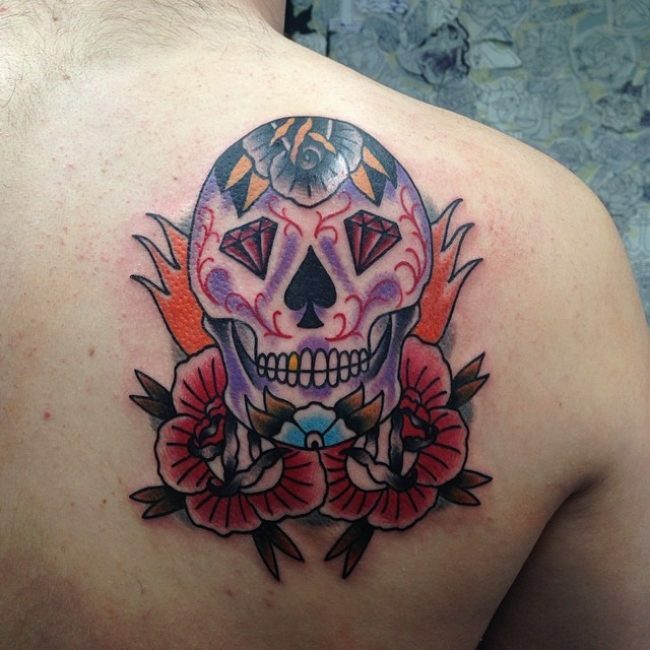 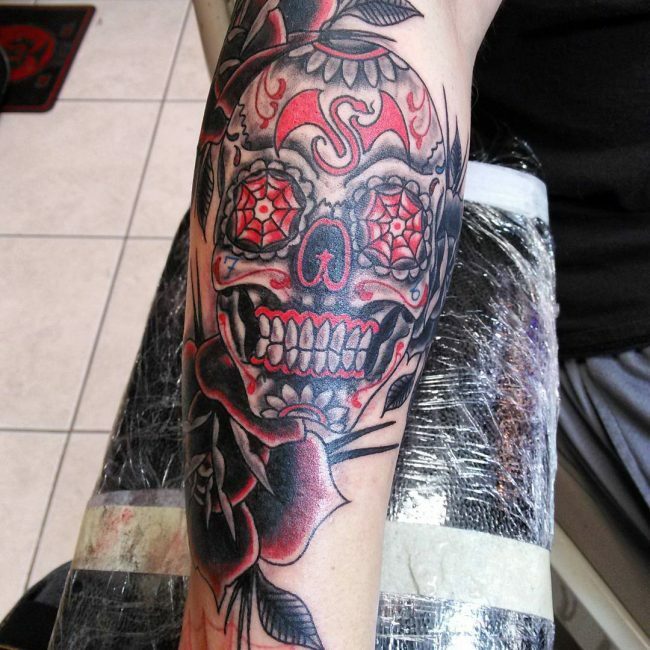 Skull tattoo designs decorated by roses typically represent the contrast existing between good and evil. 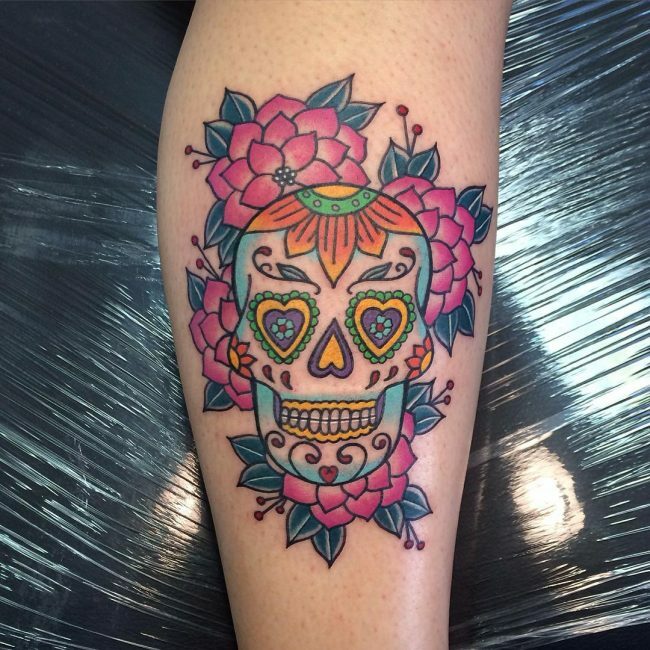 A girly version of the skull design often has heart-shaped eyes or bows. 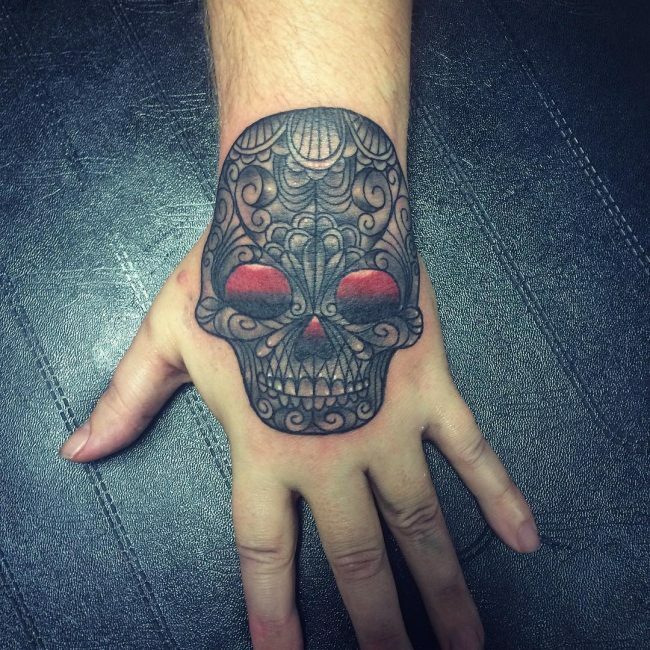 All being said; it is not necessary that every design has to be based on human skulls. 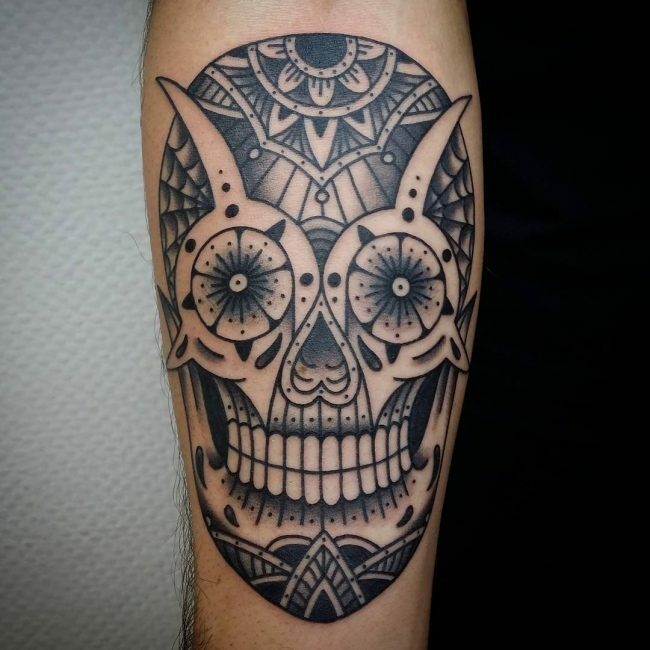 Many people opt to get designs of animal skulls instead, including the popular ones like deer, buffalo, bull, goat, etc. 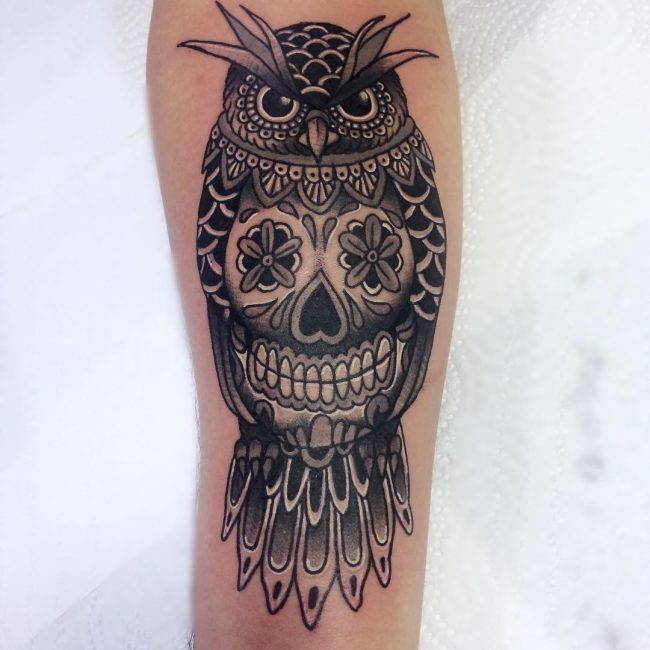 Each of these animals represents different moods and meanings and hence is extremely precious to those who get themselves inked with these designs. 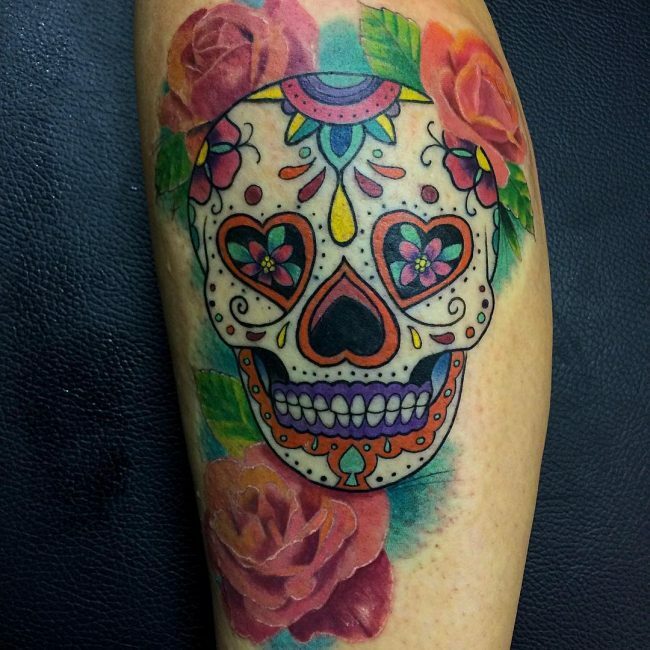 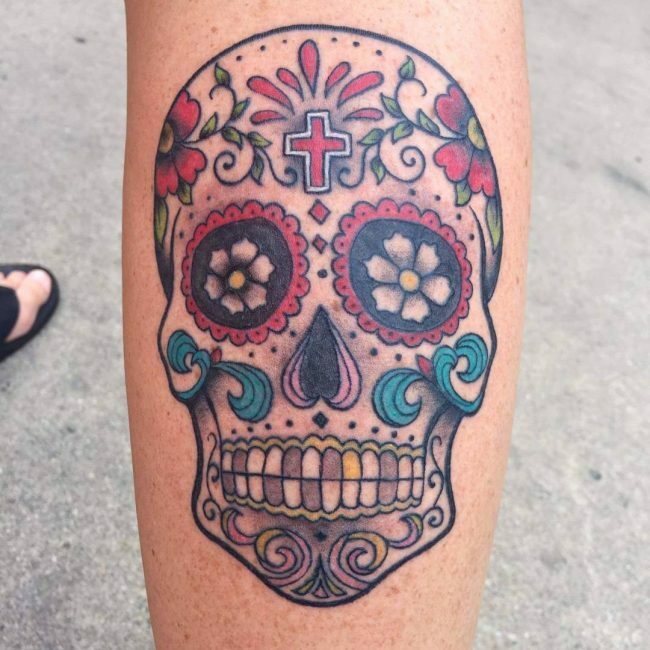 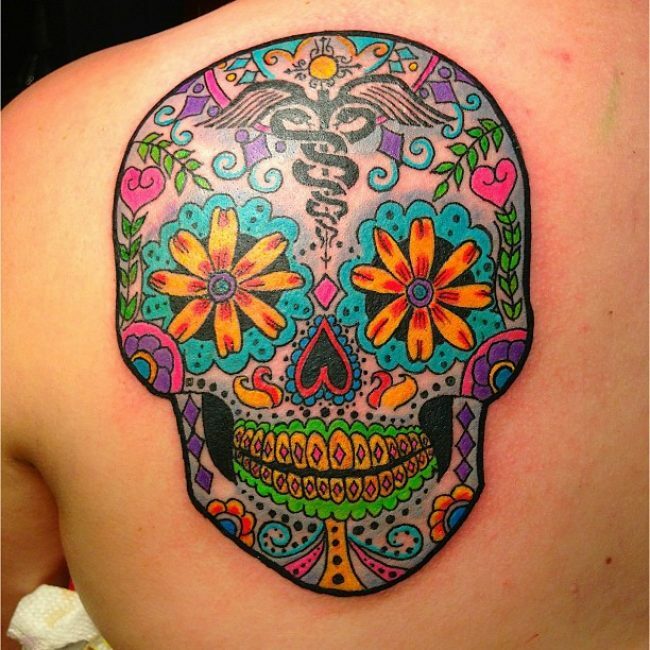 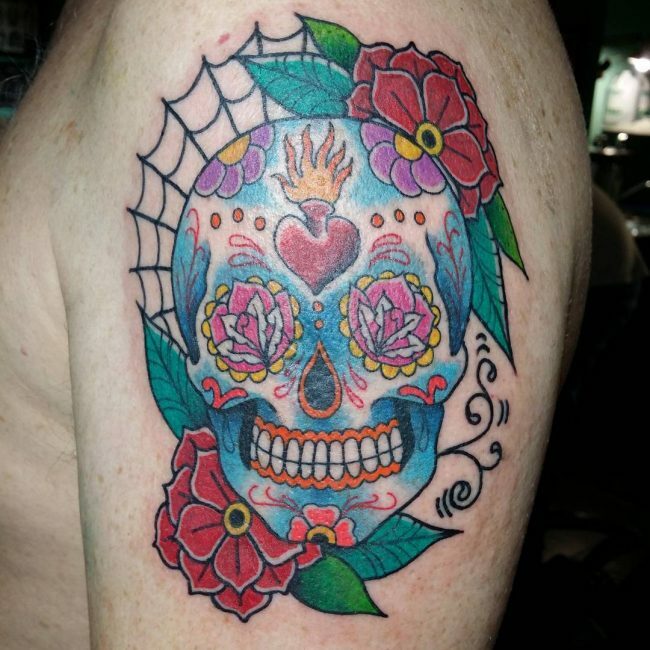 One question that lingers in the minds of many is that why are so many bright colors used in designing the sugar skull tattoo? 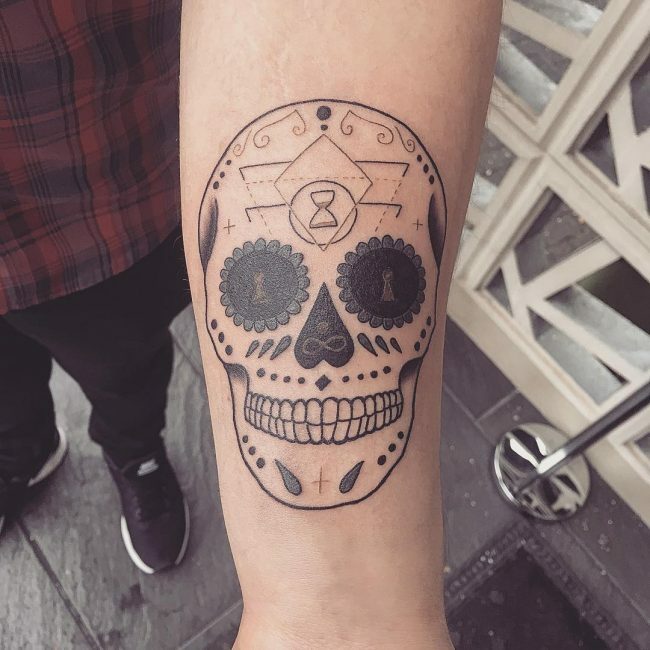 Well, as you mentioned earlier, most of these that are designs represent a celebration of life. 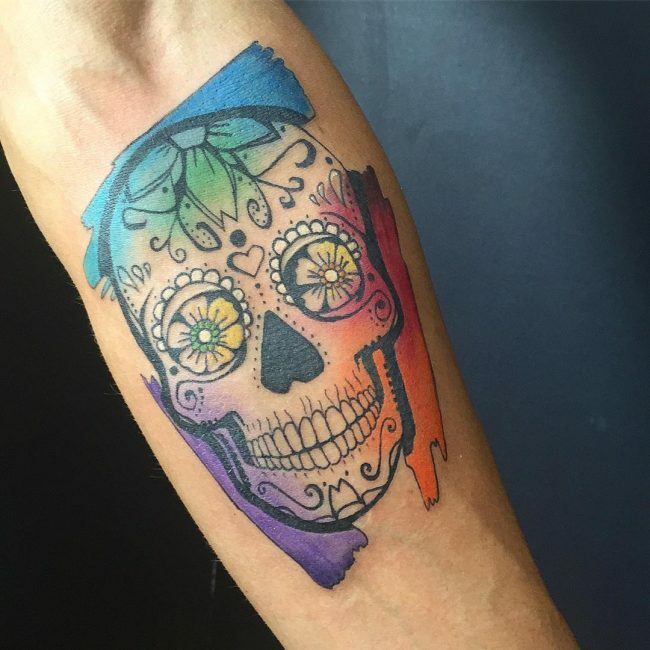 The skulls that are depicted in this context are not meant to be frightening or morbid, and so there is greater room for flexibility in adding colors. 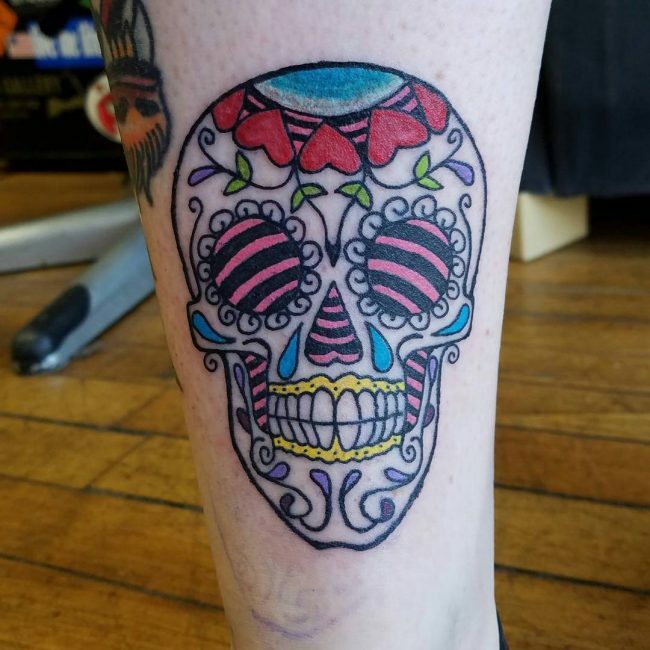 Depending on the artist and the taste of a person, you’ll probably find that every tattoo of this kind has at least four colors. 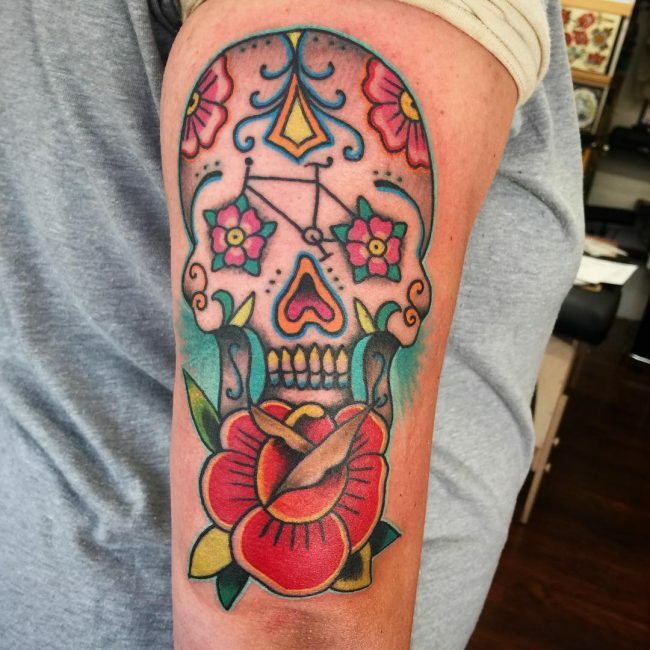 Even though there are no specific set of meanings attributed to the colors, most of the time they represent celebrating life as it once was. 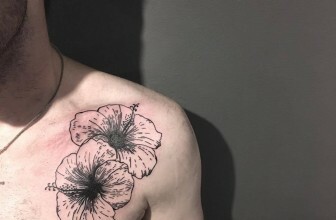 Yes, “was” is the keyword here because these tattoos often represent the passing of a soul to a higher existence where no anxiety or suffering exists and all that is left is joy and celebration. 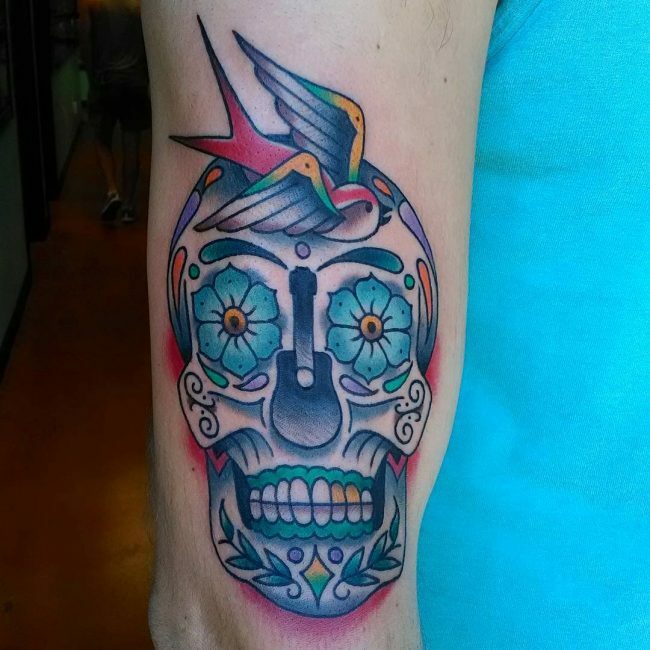 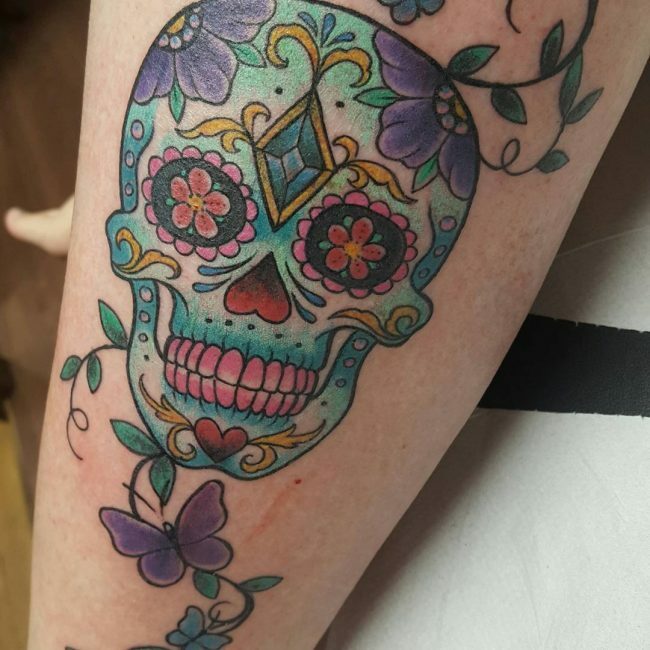 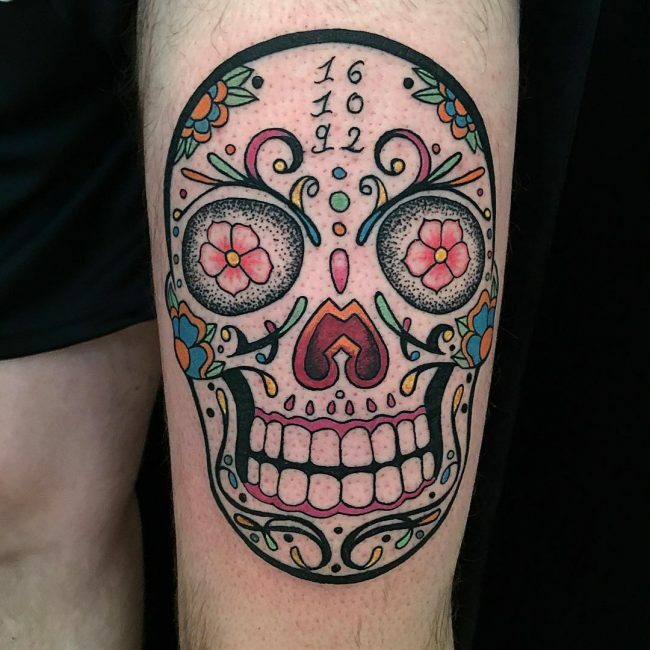 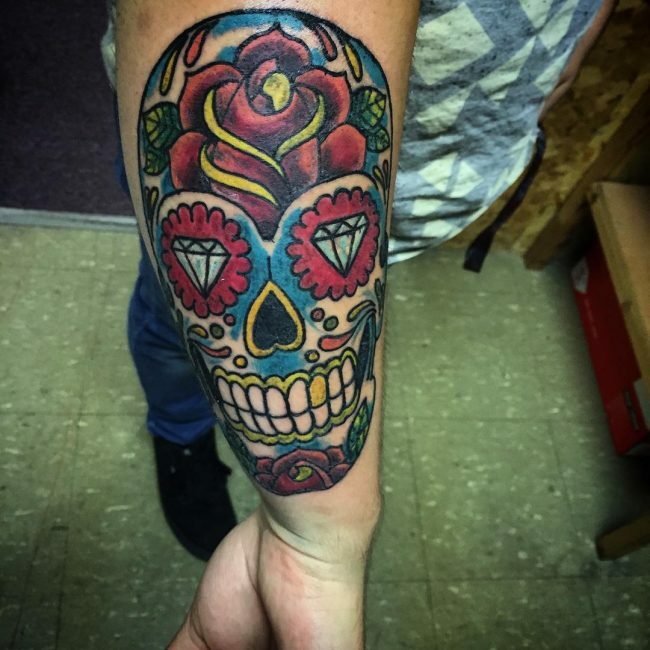 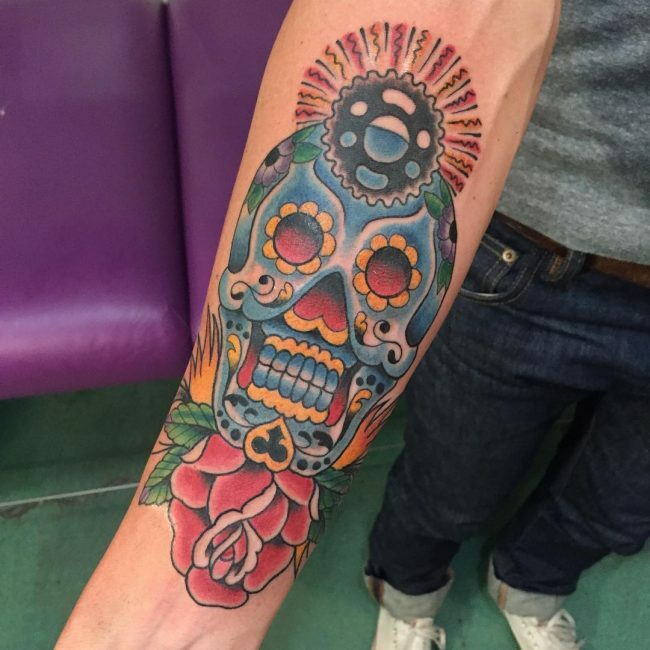 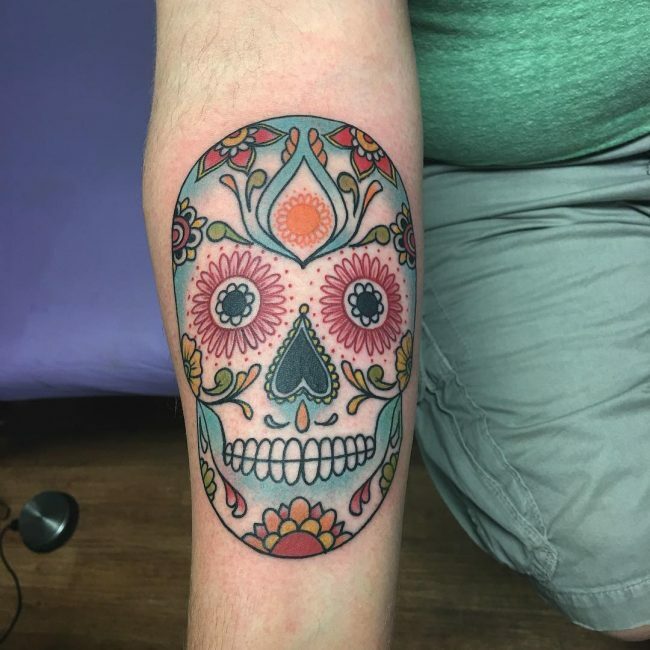 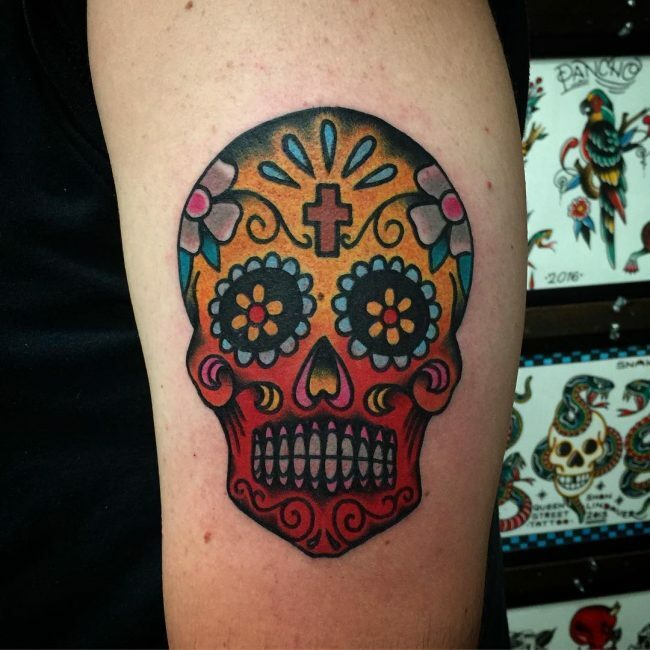 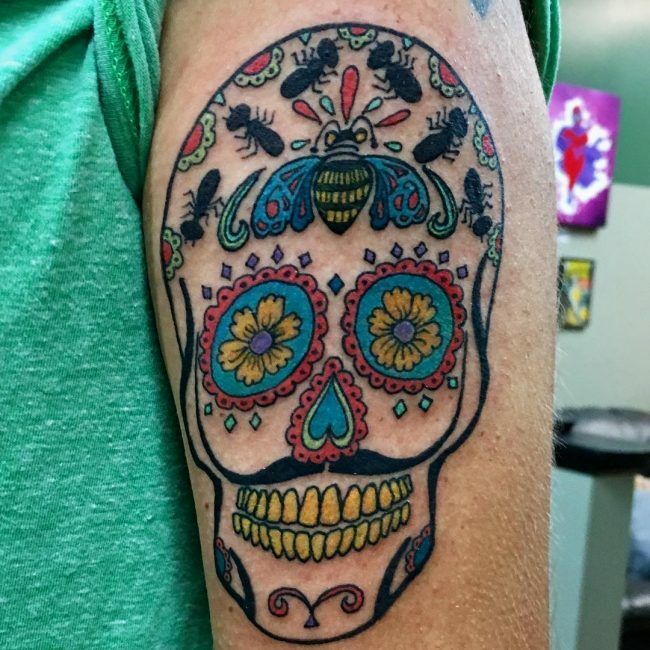 Even though skull design colors may not symbolize eternal life or anything positive, it still may portray the significance of Mexican culture that is full of life, love, and colors. 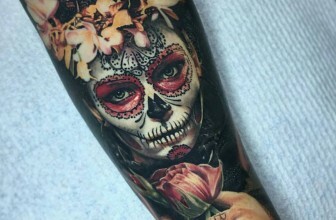 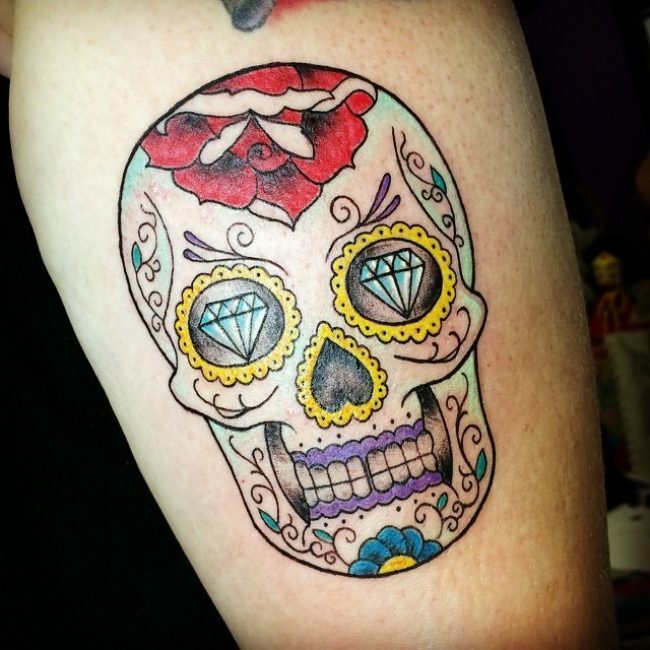 But of course, this idea only applies if we are talking about exclusive sugar skull Mexican tattoo designs. 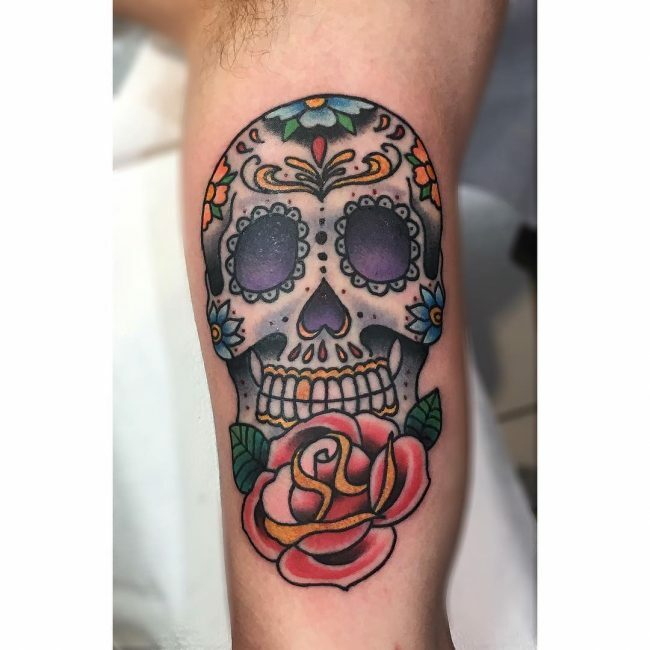 These are the kind of designs that are most popular among men as they embody all the significant meanings as well as add a masculine touch to the overall appearance. 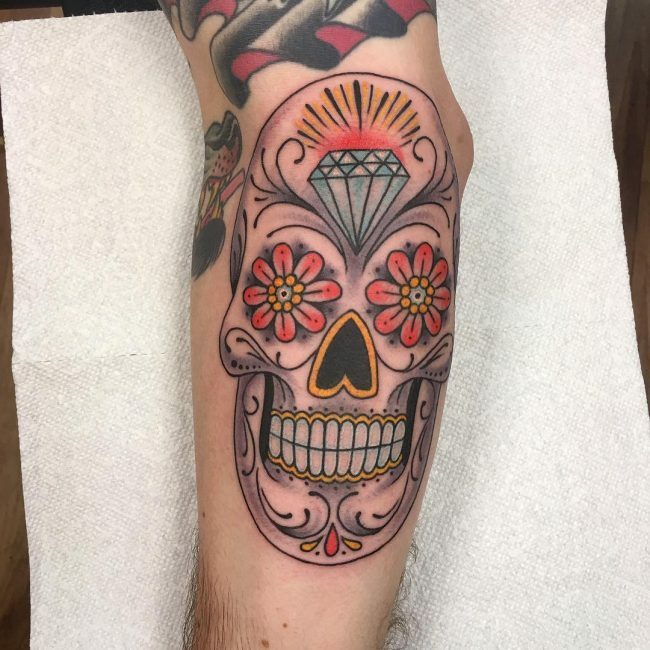 The traditional designs for men often have toned down colors that are not as bright as their female counterparts but contain objects like roses, diamonds, guns, etc. 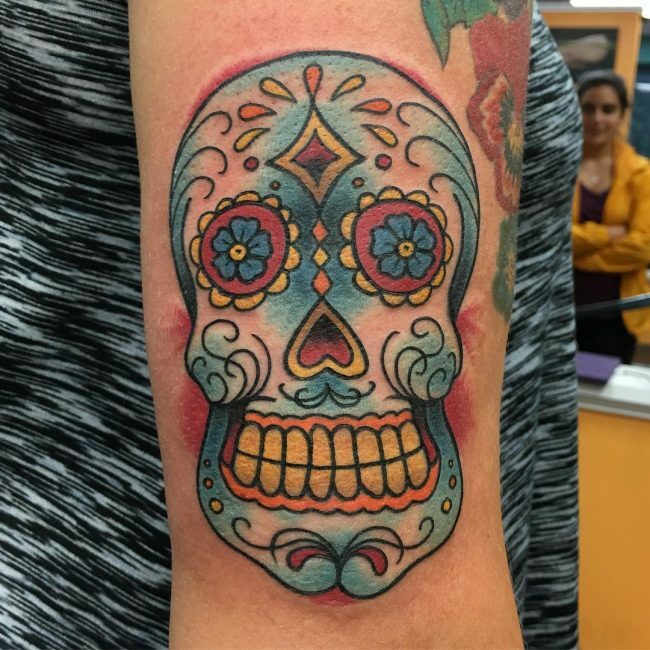 The modern artistic touch of skilled tattoo artists has given birth to a wide variety of sugar skull designs that defy its traditional roots. 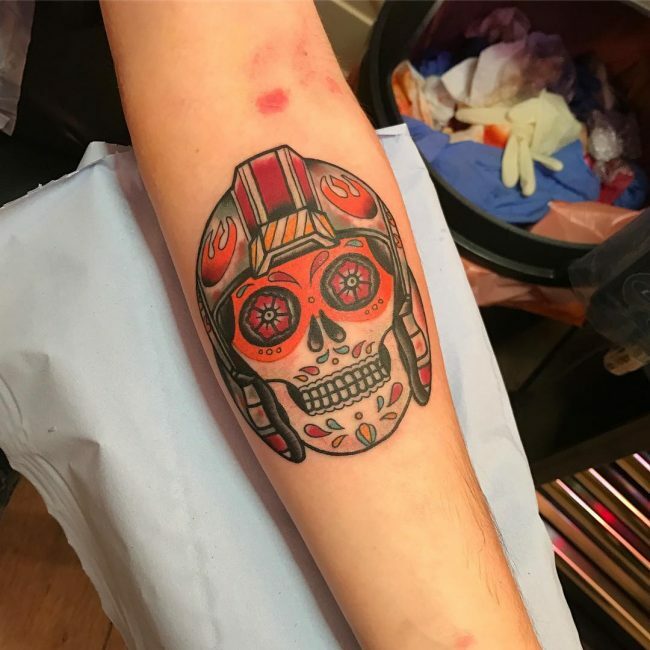 You’ll find many people sporting modern skull designs that are complete with objects like a barcode, pop culture references, English or Latin numbers, and cyberpunk themes to accompany it all. 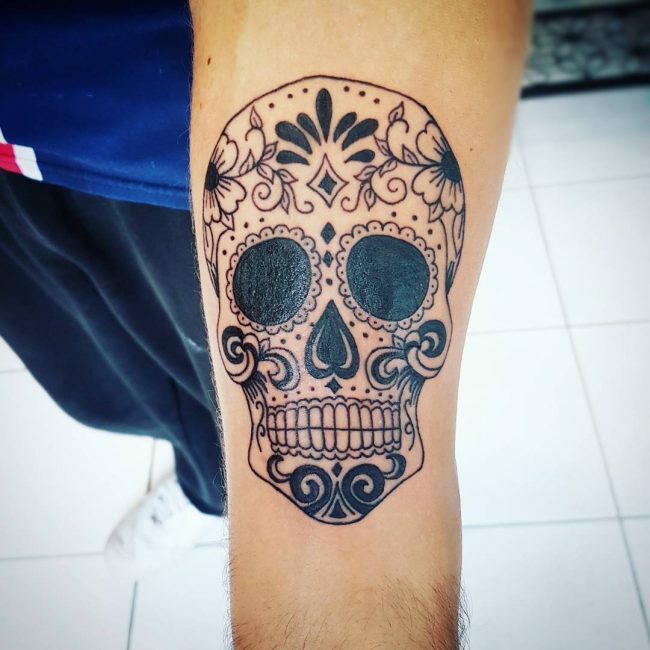 In contrast to the regular colorful skull tattoos, Black ink designs are often preferred by men due to their simplicity and high masculine value. 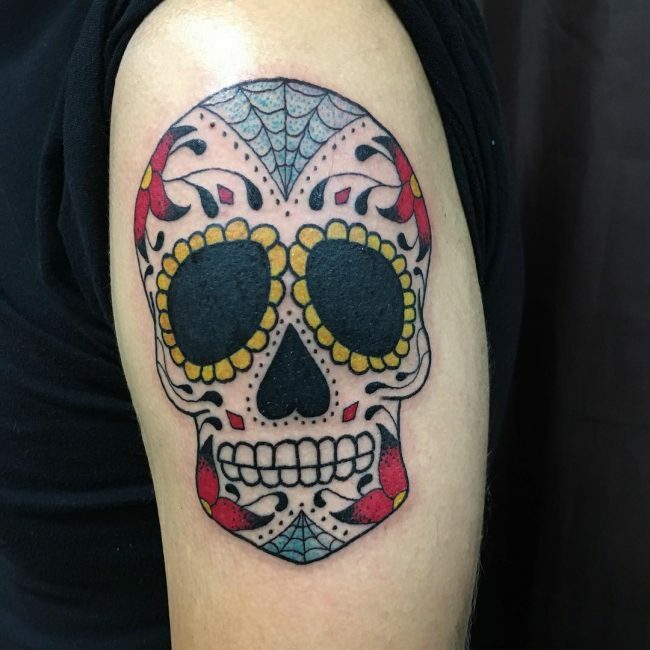 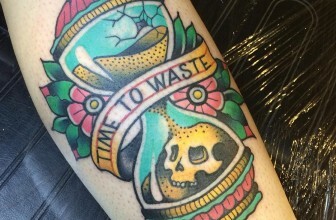 If you ever thought skull tattoos look dull without the added colors, you’ve probably never seen the different shades of a black ink design. 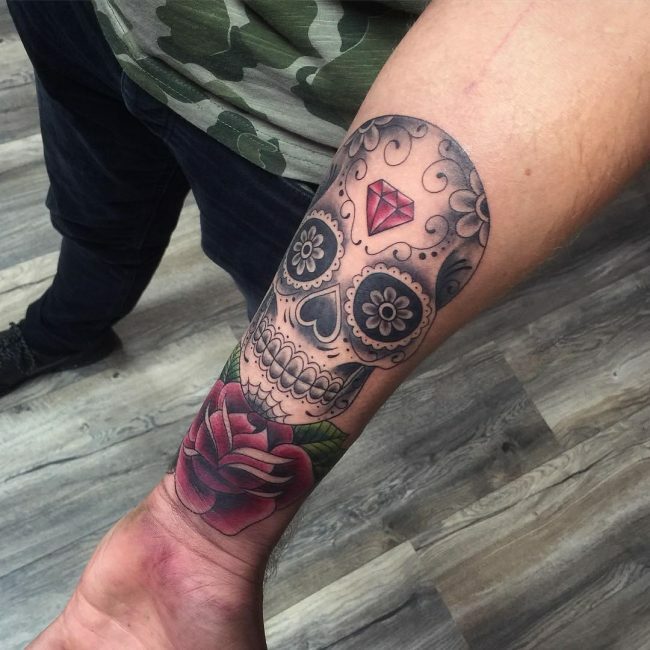 This is perhaps the most common types of design you’ll find people sporting because they are good looking and easy to do. 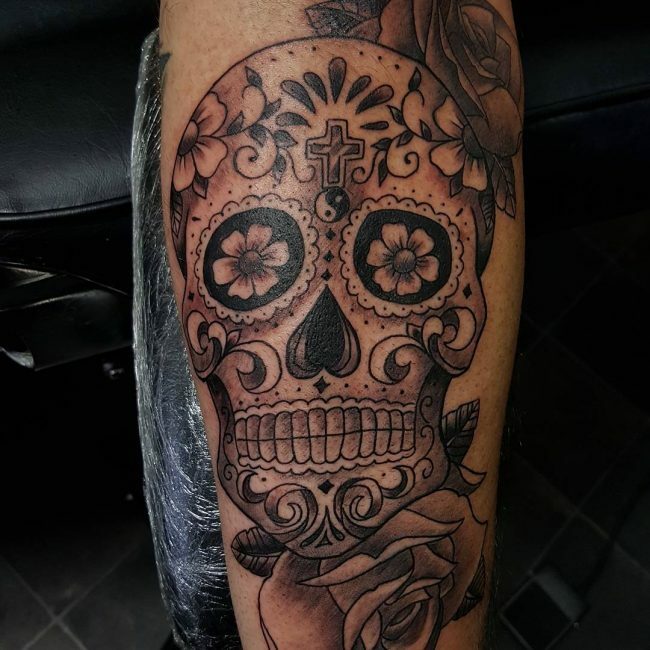 The rose, and skull combination has been a massive hit ever since people first started getting themselves inked many centuries ago. 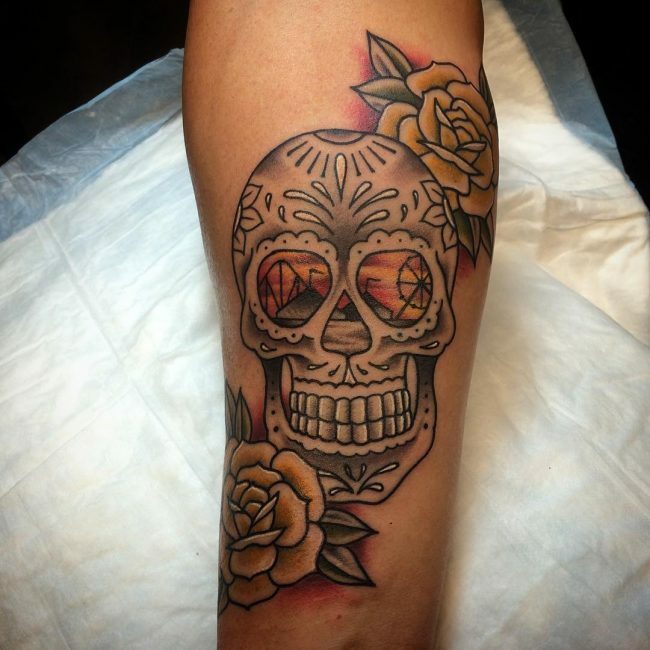 Even though widely preferred by the ladies, men can also get this variety with toned down colors. 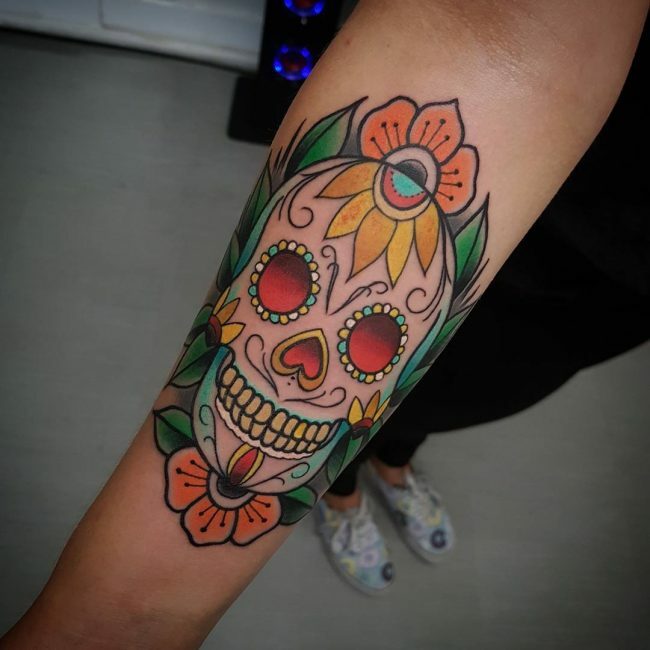 These designs are quite a rage in the market nowadays owing to their outstanding design aspects and flexibility in replicating a real-life skull. 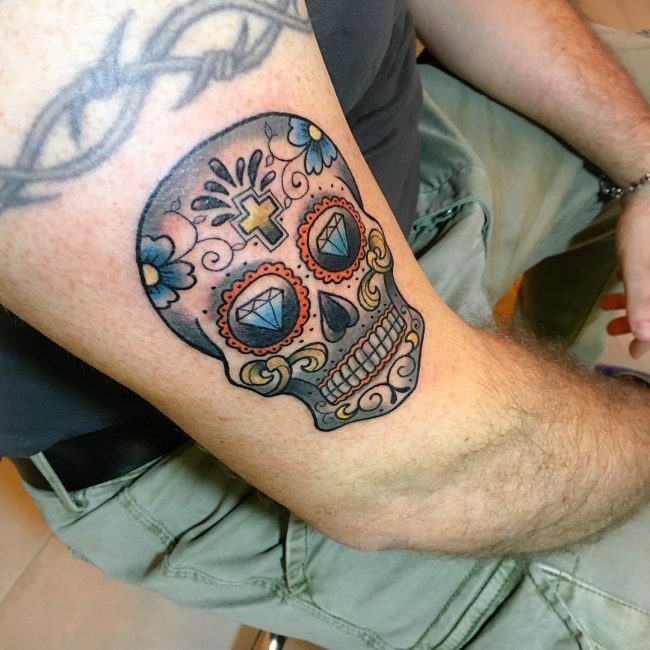 3D skulls can be placed anywhere depending on the person’s choice and can truly bring out the essence of sugar skulls and all they stand for. 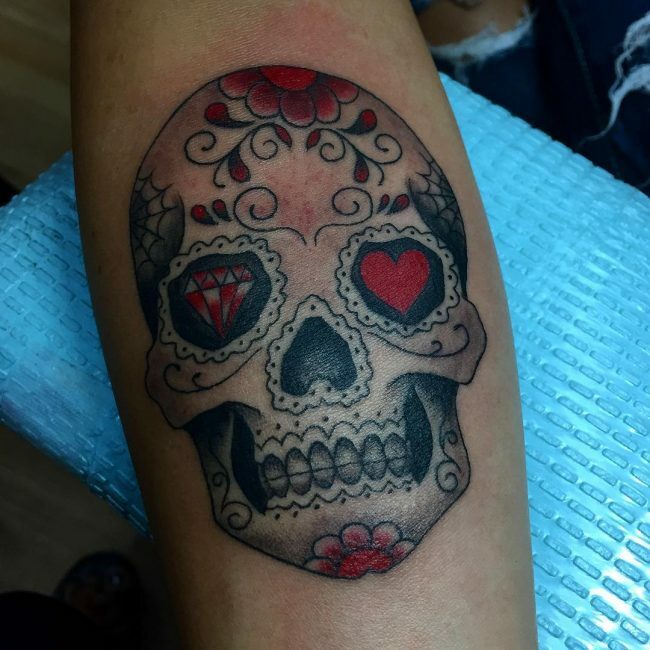 A sugar skull tattoo can be a highly personal symbol with a specific meaning to the person who is having it inked on their body. 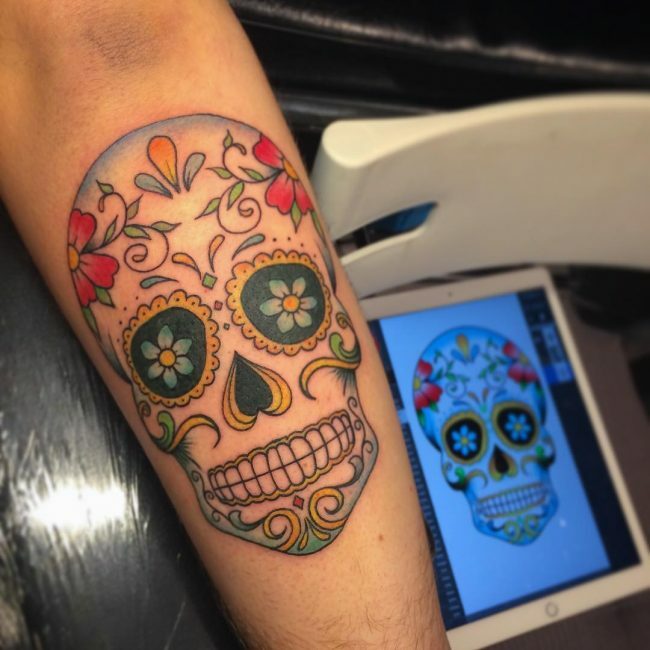 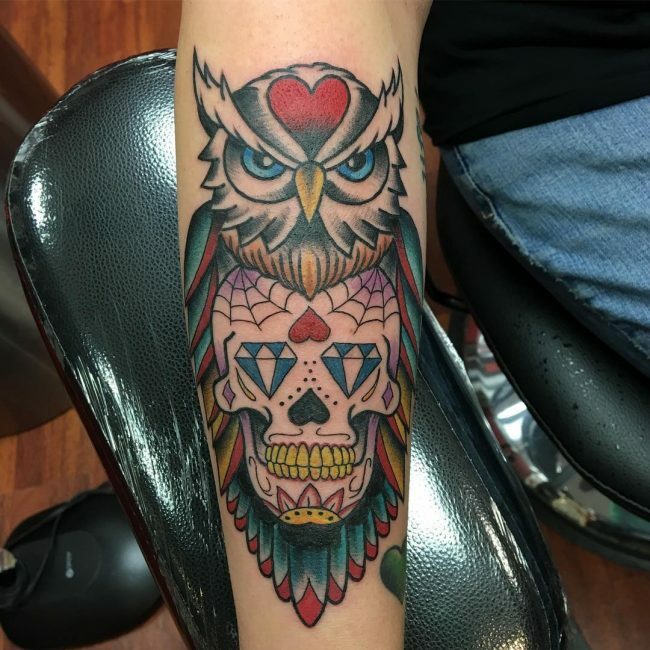 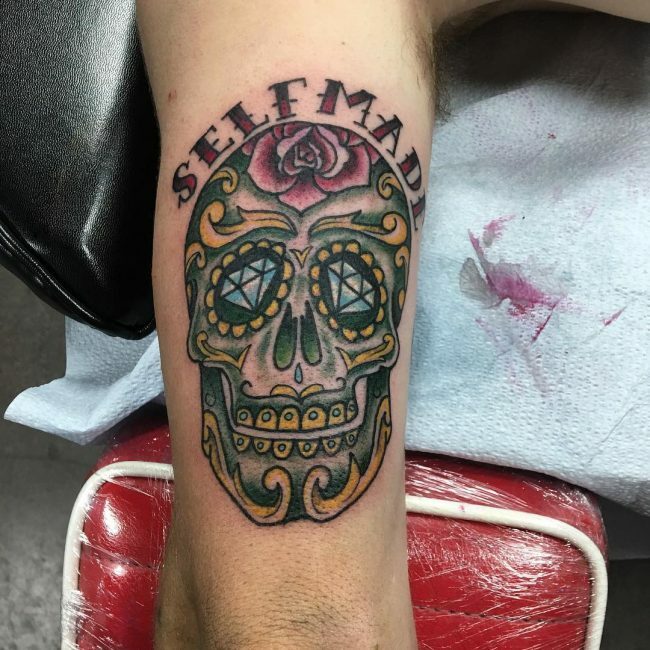 To choose the best tattoo that suits your personality and body type, it is advised that you consult openly and honestly with a reputed artist and go over the available options. 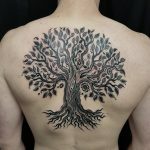 After all, getting yourself inked means forming a lifelong bond that you’re probably going to take to the grave probably.